We urgently need to charge our video camera before going anywhere! We hope to find an electricity socket at the tourist information near the train station and indeed, we are lucky! So we spend an hour here, reading through the various options of what to do in Oslo. 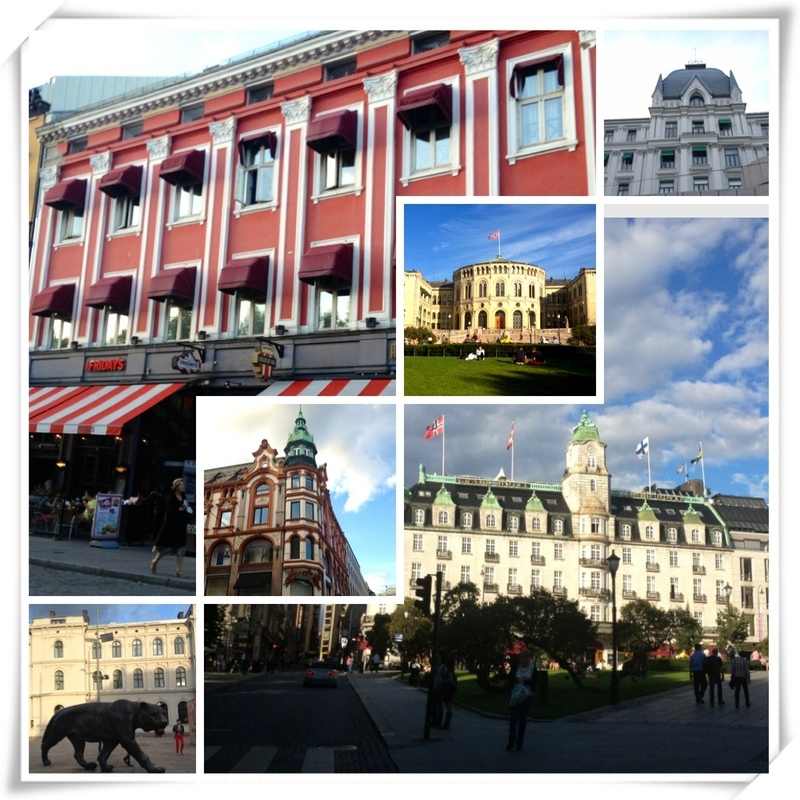 Amazingly Oslo has 52 museums and since we already checked out the city on our bicycles yesterday, we are keen to check out some museums today. The big question is: To get the Oslo Pass or not to get the Oslo Pass?! 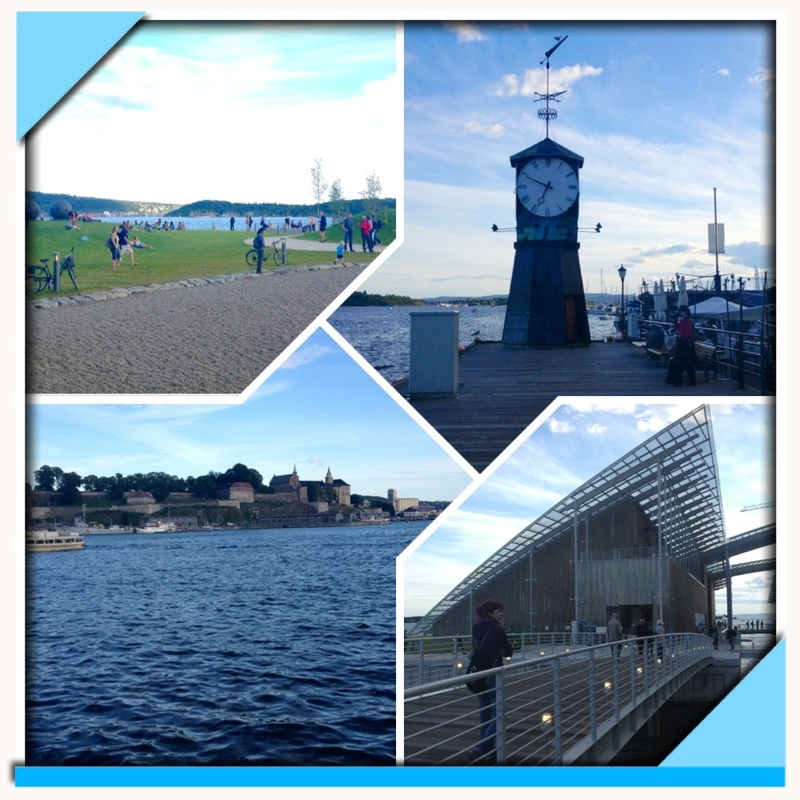 The The 24hr Oslo Pass is 270NOK (57EUR or about $70) per person and will give you free entry to most museums, free parking in the city council car parks and free public transport, including the ferry to the museum island. Looking at it realistically, how many museums can you visit in 24 hours when the opening times are only between 11am and 6pm? We decide we want to visit at least 4 museums, ideally 6! Should be do-able, shouldn’t it? We decide for the Oslo Pass and jump on the subway number 1 going to Holmenkollen Ski Museum and Ski Jump. We stamp the Oslo pass at the train station but later realise we did so in the wrong area. Oops. The subway soon becomes a normal train, as we exit the underground train network and now drive up higher and higher, soon overlooking all of Oslo and the fjords. Of course the rain begins to pour down once we arrive at Holmenkollen but gladly we brought a rain jacket and a frog green rain poncho. Firstly we discover the ski simulator which takes you onto the ski jump and the downhill ski track, pretending to reach more than 100km/h. 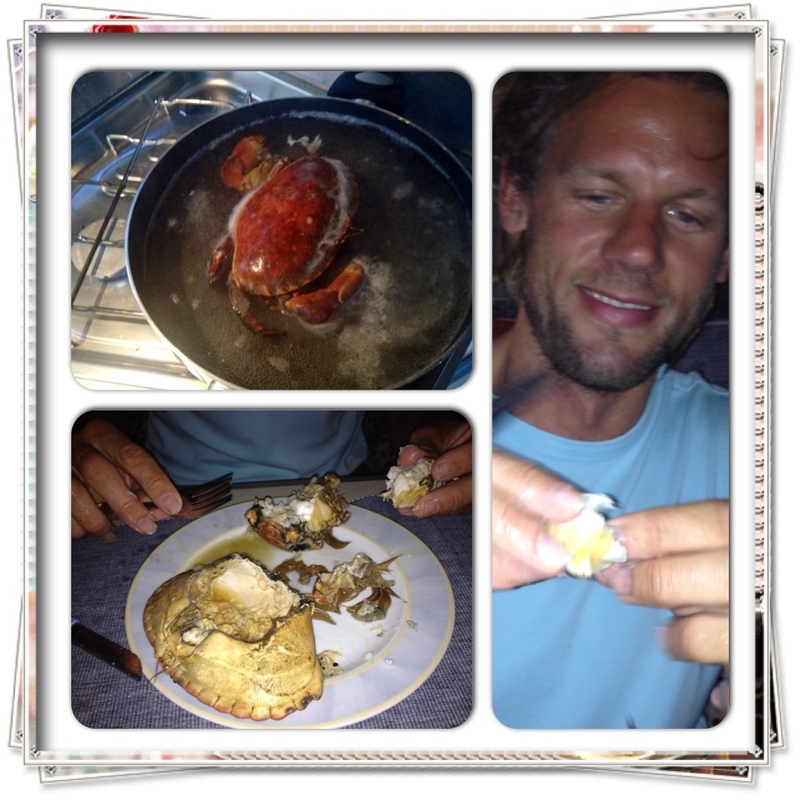 This is an extra 60NOK per person but we have to give it a try. Now, having done it, I guess it was ok but it’s difficult to really simulate ski jumping! Now the ski museum: We enter, show our Oslo cards and are permitted in without any problems (even though there is supposed to be a start date and time on the Oslo pass but the space is still blank). So basically the 24hr valid time hasn’t started yet. 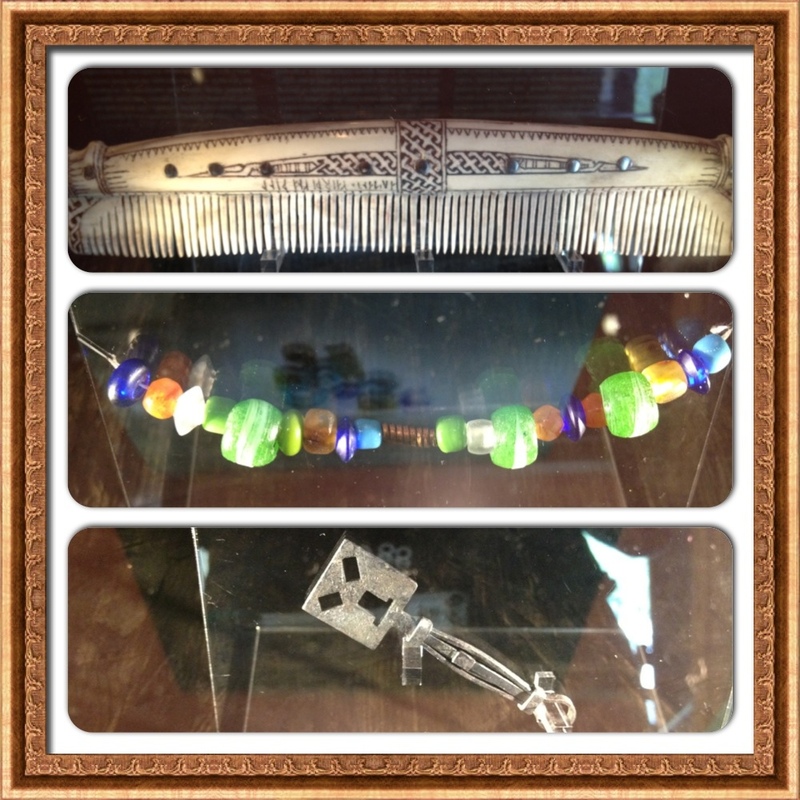 The museum exceeds all my expectations! I thought we may see some old skis from the 50ies and a few photos of ski jumping but instead the museum’s story starts with Roald Amundsen’s journey to the south pole. One of his dogs is displayed here, stuffed obviously. We get to see some of their equipment but mainly of course the skis and sleds. Just around the corner I find a man dressed in reindeer fur holding up his skis – 4000 years ago! This man belongs to the Sami culture. 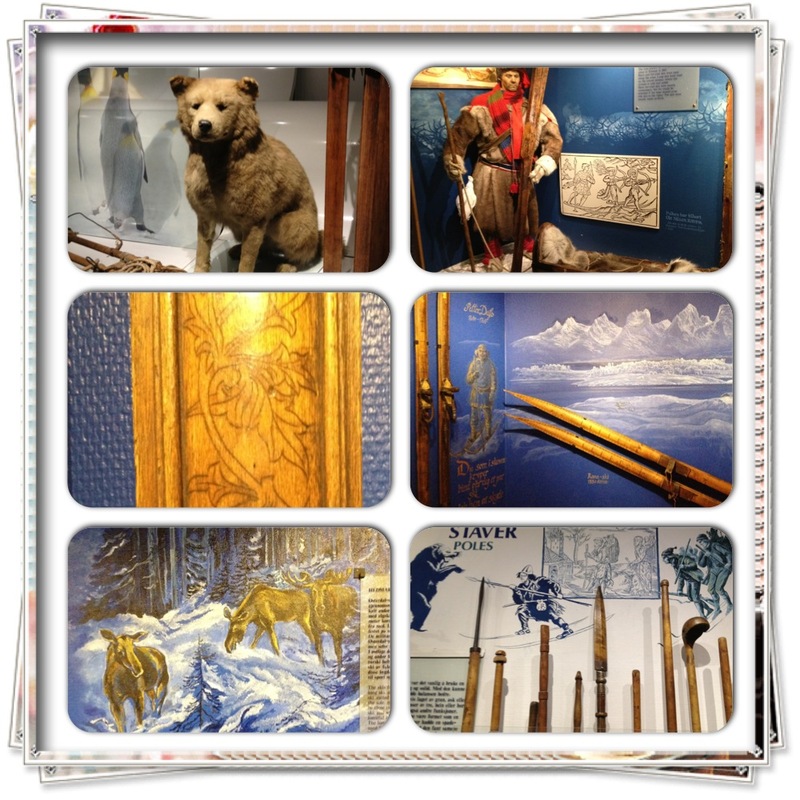 Original skis from 600AD or skis that are beautifully decorated with ornaments from the 1890’s are being displayed. Until about 1890, skiers only used one ski pole for breaking and balance and often the end would have another function. It could have been in the shape of a spear for hunting bears, a shovel or even a drinking cup. There are stuffed animals like this very large elk and some of the photos are quite amusing; one showing two laughing women in their early 20th century dresses and on skis all covered in snow, another one showing a little 2 year old boy on his skis and with the question: Are Norwegians born with skis on? Another highlight is the spectacular preview of the documentary film “Being There” made by producer Filip Christensen (Field Productions). It shows an amazing view (mostly from the helicopter) of the worlds best free skiers climbing and skiing down mountains in the fantastic Norwegian landscape. There are no words to describe this footage, you need to see it for yourself. As soon as we are getting wireless internet, we will download the full movie from iTunes. I also love the soundtrack! From inside the museum you can take an elevator up to the top of the ski jump and get a 360 degree view over Oslo, fjords and forests. Very nice! 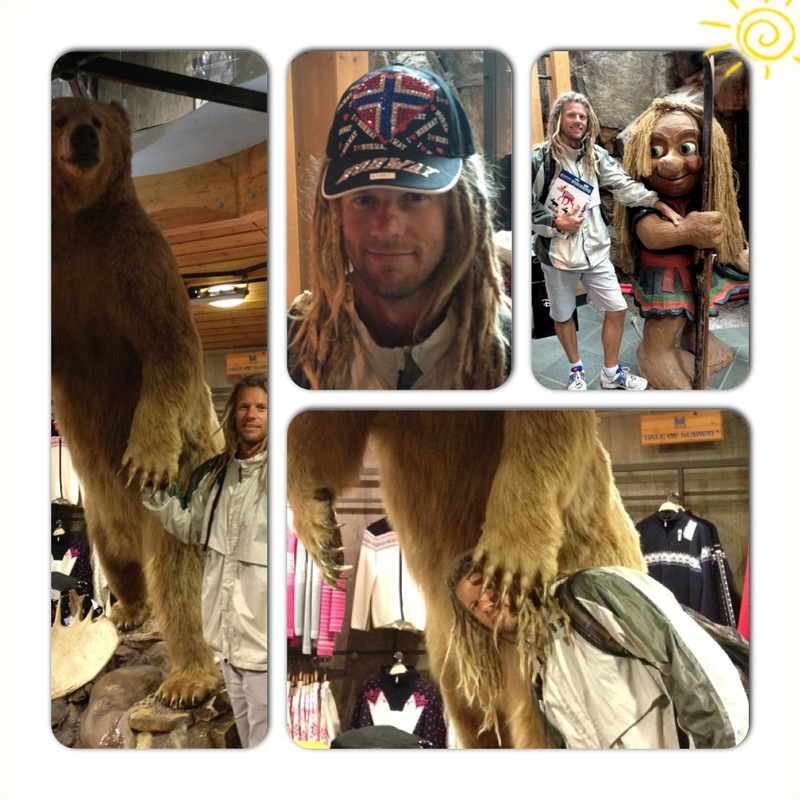 Eventually we are coming down to the souvenir store where Logan does not only pic up a Viking T-shirt and some Norway stickers, he also shows his love for Norway by trying on a I-glitterheart-Norway cap, as well as hugging the “little teddy bear” and the pretty troll girl. Having spent 3 hours at the Holmenkollen Ski Museum, we are going back to the train station, finally stamping our Oslo Ticket properly. Off to the Viking Ship Museum! We get back to the city centre, pick up our bicycles and ride to the port. From there we catch the free (with the Oslo Pass) ferry to the museum island and walk up the road to the Viking Ship Museum. We only have about an hour until the museum closes. The Viking Age lasted from about 800 – 1050AD. During this period the Norseman were the lords of the sea. They were excellent shipwrights and sailors. Their ships were fast, well built and suitable for long sea voyages which enabled them to go on journeys in most of the northern hemisphere. From Scandinavia the Vikings sailed west over the North Sea to the British Isles and then over the Atlantic to Iceland, Greenland and North America. Some sailed south down the coast of Europe and entered the Mediterranean, while others sailed east down the great rivers of Russia to the Black Sea and the Caspian Sea. At the beginning of the Viking Age Norway consisted of a number of smaller chiefdoms, but was later gradually united under a single king. Viking society was divided into classes with great economic and social differences between them. The ships exhibited in the museum were built for members of the upper class. The farmers formed the backbone of the society; they were free men with the right to bear arms and to participate in meetings of the “ting”, or assembly. The slaves were the lowest rank in society; they were the property of their owners and had no legal rights. Many of them were foreigners who had been taken prisoner on a raid. Since the Vikings came from Scandinavia, from Norway, Sweden and Denmark, they had to adopt to a great variation in their landscape, climate and agricultural conditions. In good farming country, crops and animal husbandry were the main means of livelihood, while in other parts people relied more on hunting and fishing which were profitable activities. Furs, bird down, and walrus ivory were highly prized commodities in the rest of Europe. Considerable quantities of iron were also produced in the Norwegian mountain hamlets and found a market both at home and abroad. The Norsemen plundered churches, monasteries and even whole towns but plunder and conquest weren’t the only reasons why the Vikings took to the seas. Many of them journeyed abroad in order to trade, and others to find new country in which to settle. The Vikings were also merchants, selling their goods in towns and market places, and established trading colonies in Ireland and Russia. Many Norsemen settled down as farmers in the lands they had invaded, such as Iceland or Greenland and they were the first Europeans in North America. In the Viking age it was customary to bury the dead in boats. In the ships exhibited here at the museum, the dead were placed in a burial chamber which was erected in the stern of the ship. They were buried with a good supply of food and drinks, horses and dogs, and both useful and decorative objects. When the ships were excavated, the graves were found to have been robbed and the jewellery, weapons, gold and silver were no longer there. The objects made of wood and cloth were well preserved, because the ships had been buried in blue clay and covered with stones, clay and turf. 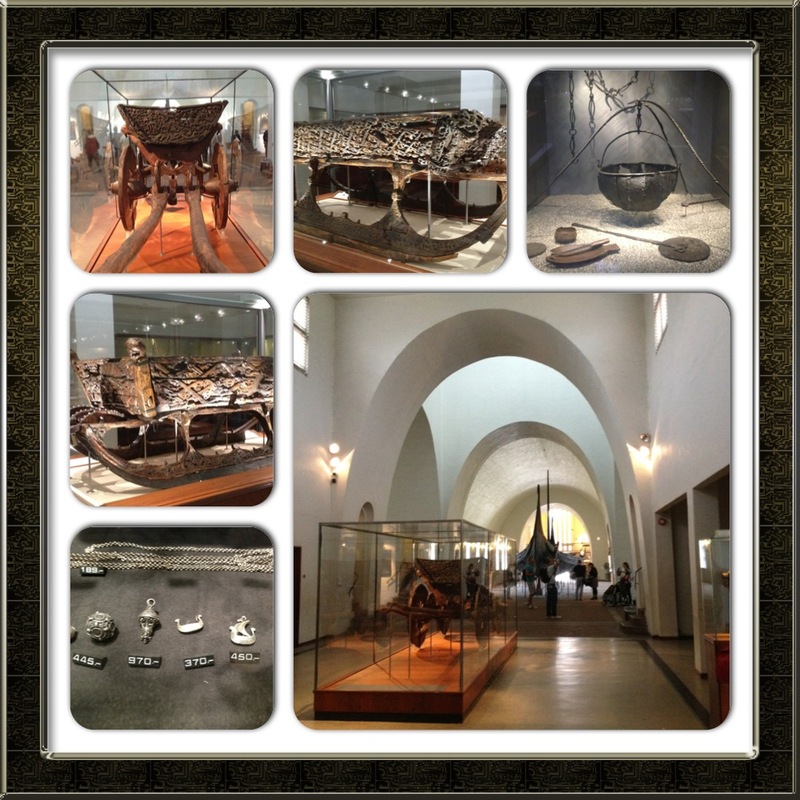 Upon entry our view falls onto the huge and well preserved viking ship: The Oseberg Ship. The Oseberg ship was found in a large burial mound on the Oseberg farm in Vestfold and excavated in 1904. The ship was built some time between 813-829 AD, but was later used as a grave ship for a woman of high rank who died in 834AD. The 22 meter long ship was built of oak and the number of oar holes indicate that the ship was rowed by a crew of 30 men. The second Viking ship, the Gokstad Ship, was found in a large burial mound on the Gokstad farm in Vestfold and excavated in 1880. It was built around 890AD and later used as a grave ship for a Viking chieftain; the body lay in a grave chamber built of horizontal timber logs. This ship was 24m long with room for 32 oarsmen. 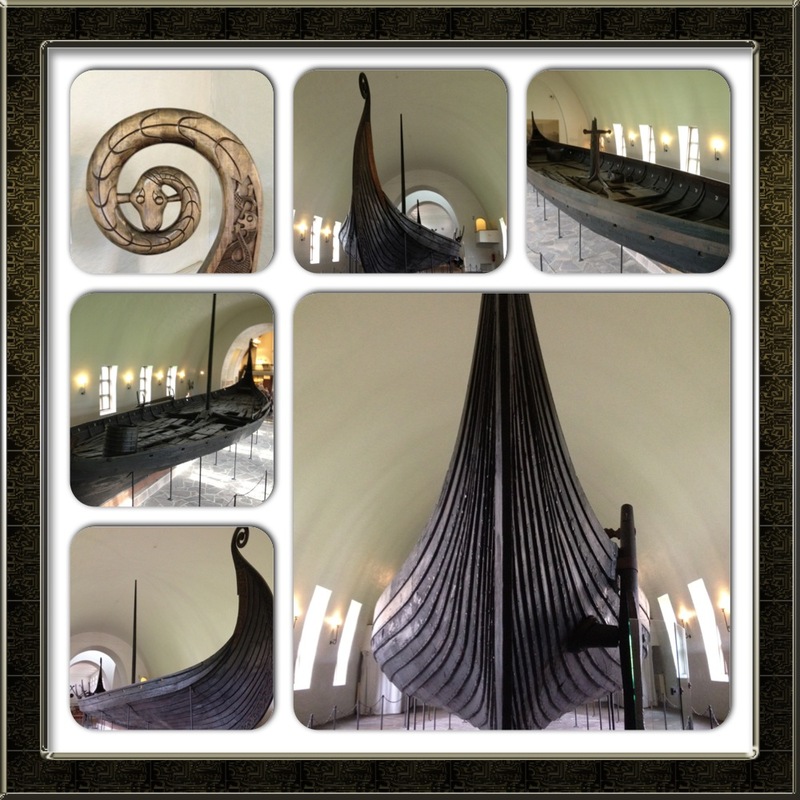 It is the largest of the Viking ships on display and also the most robust. While the Oseberg ship was a luxury pleasure craft, the Gokstad was a sturdy and practical vessel, capable of sailing the high seas. 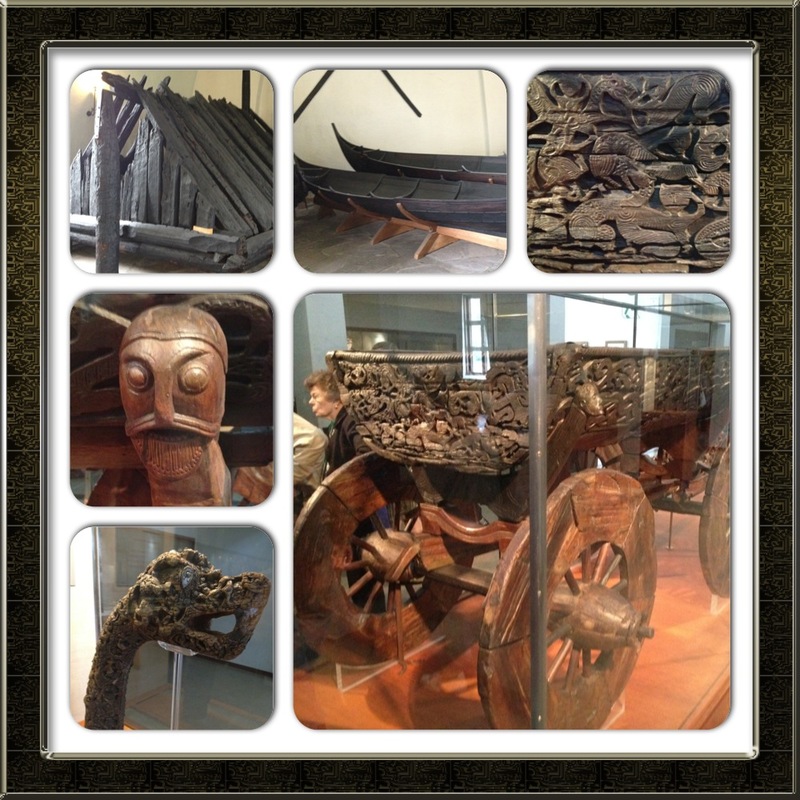 There’s also a third Viking ship in the museum, the Tune Ship. It was found on the Haugen-Hof in Ostfold and excavated in 1867. It was also built around 900AD but due to poor preservation conditions the grave gifts have not survived and the ship has has been severely damaged. 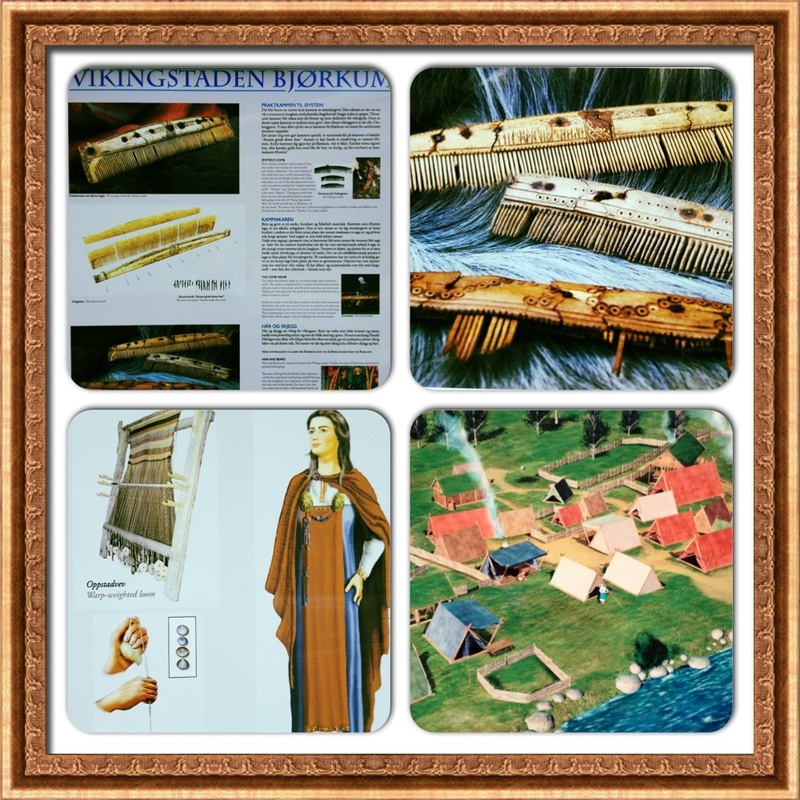 The skills of the Viking shipwrights were based on long and solid experience. They did not use plans or drawings but instead took measurements by eye. The sails were made of woollen cloth and it required almost as much work as the it did to build the ship. The Gokstad ship’s sail measured 110sqm. The origins of Norse ship-building can be traced back all the way to the 4th century BC. These traditions are still alive in Norway today. In the back wing of the museum we find the grave gifts and other objects such as wooden carts, wooden animal heads, sleds, “camping equipment” and more. Everything made from wood is decorated with wave, animal and plant ornaments. At the end we also have a quick look at the souvenir shop of course, where they sell books and dvd’s about vikings, but also viking jewellery. Most of it is quite expensive but Logan get’s himself a silver ring with viking ornaments on it for only about 6 Euros. 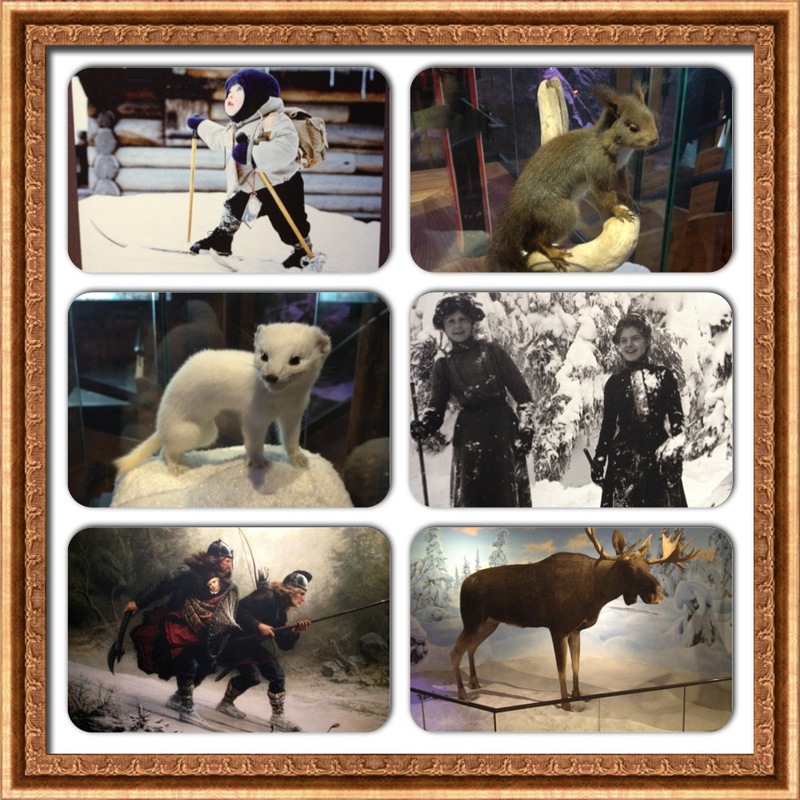 Museum Day 1 is over, we continue tomorrow! 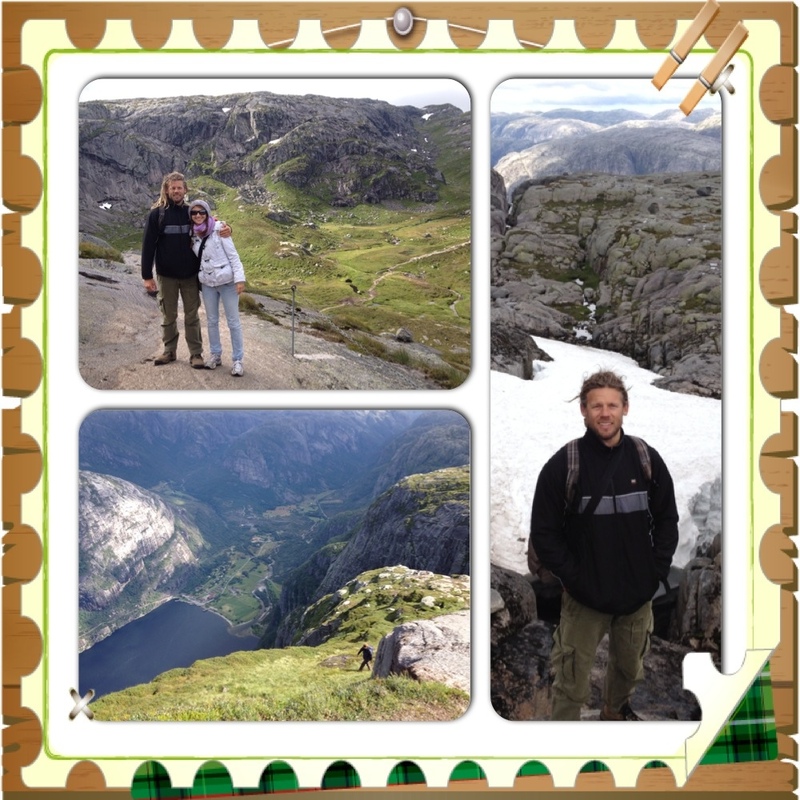 Having been to Nigardsbreen Glacier, the most northerly point of our Norway tour, we aim for Jotunheimen National Park. 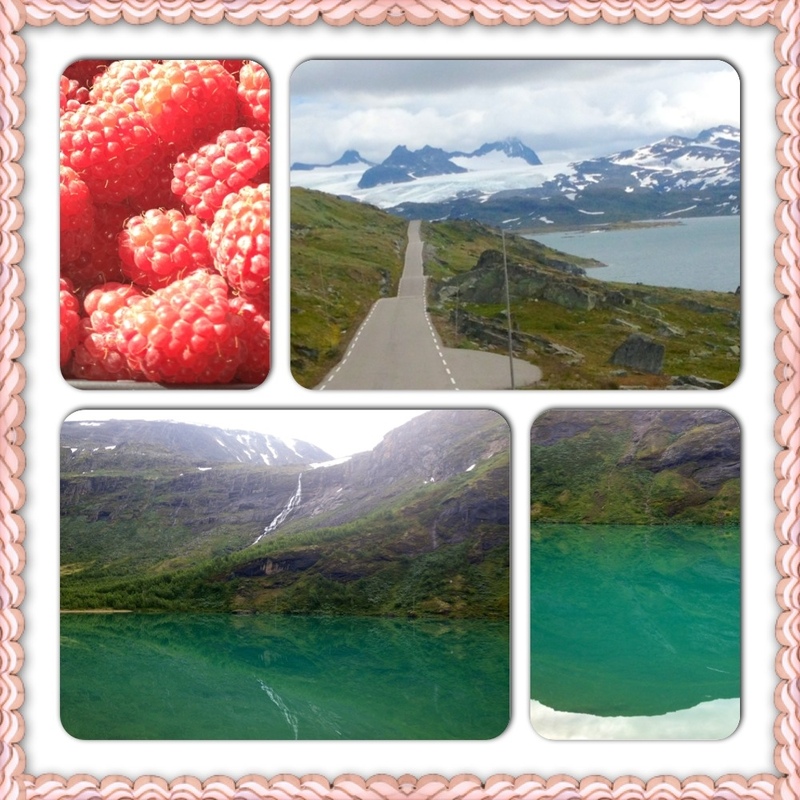 On the way we pick up some very delicious raspberries of a farmer for 30NOK. A rip off unfortunately, as we discover them in the supermarket for 20NOK about 30min later. 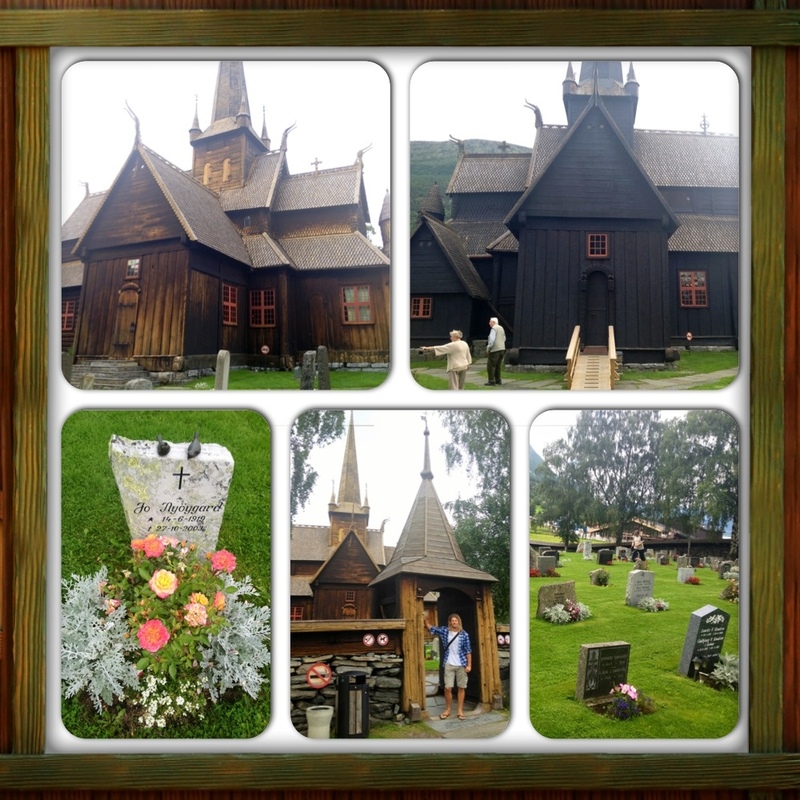 Arriving in Lom, we stop at a Stave Church and the tourist information centre where Logan picks up a 2013 calendar with pictures of Norway. We drive over a pass, overlooking Norway’s highest mountains of up to 2469m. There is even plenty of snow up here still and many glaciers make their way down. Gjende lake is described in the travel book as Norway’s most beautiful lake. Unfortunately we arrive there when the sky is dark grey and rain is just starting to fall. We are very low on diesel and feel a little too nervous to stay, so instead just drive on, hoping to finally find a petrol station. The mountain scenery is incredible and distracts us from our worries for at least a little while. 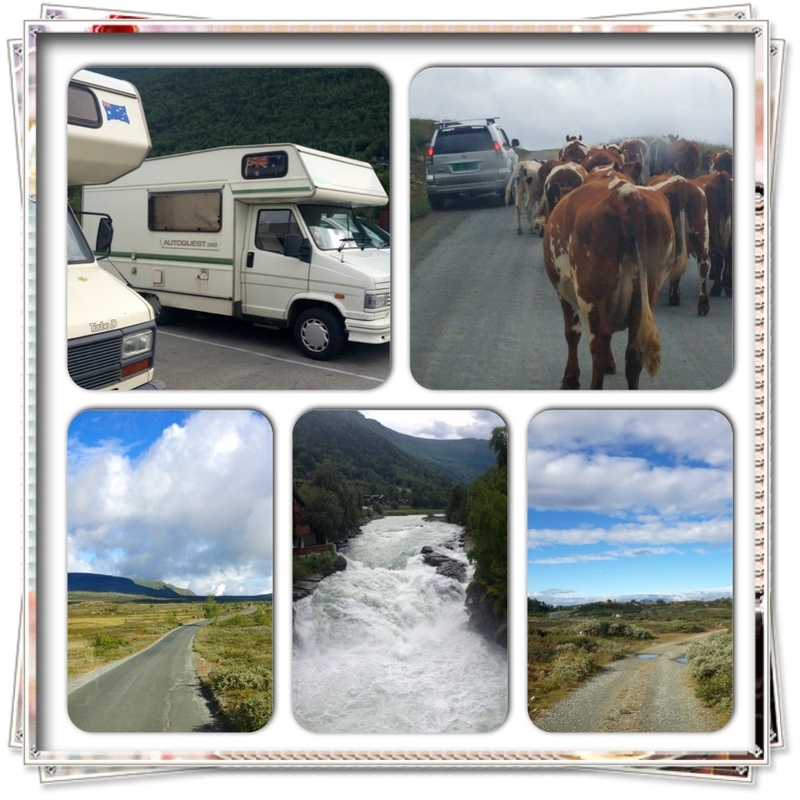 Finally in Beitostølen, we discover a petrol station – thankfully! After filling up diesel, we backtrack a few kilometers and then turn right in a private toll road called Jotunheimsvegen. The entry fee is 80NOK (11€/$13), pretty expensive I think at first but considering that this is privately owned and supposedly the most beautiful mountain road in all of Norway, we are happy to pay. Along the road we pass a few small huts and houses and many lakes. Some cows block the way and even though we almost hit them with our van, they only move out of the way veeeery slowly. We make camp here on Jotunheimsvegen for the night. Logan is off fishing again, comes back soaking wet but as (almost) always: without any fish. 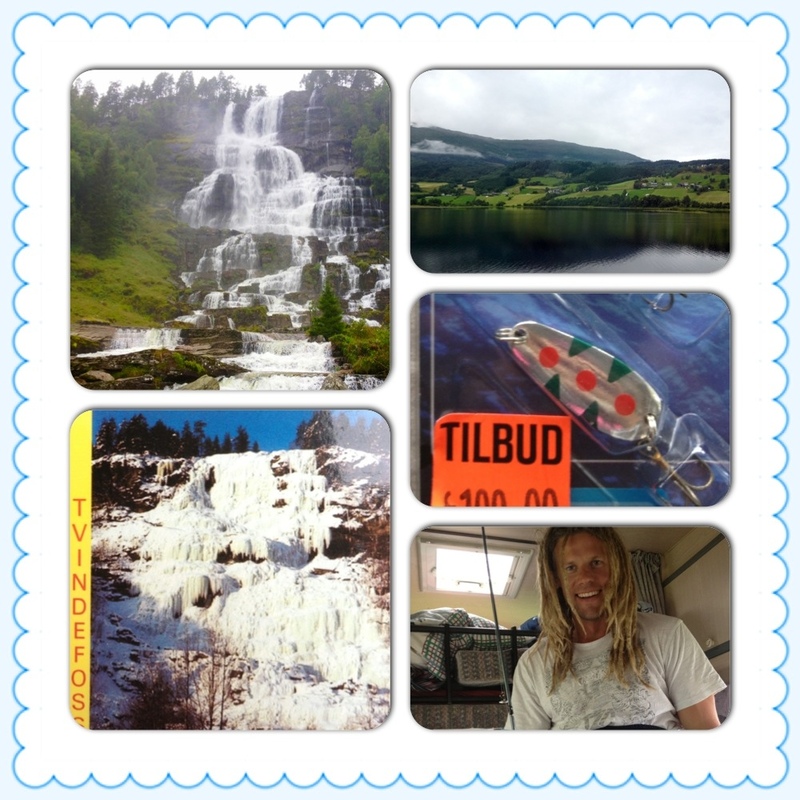 In the morning the road takes us to Skåbu and then onto Lillehammer. The scenery changes drastically from a treeless mountain landscape to green fields, forests and blue lakes. 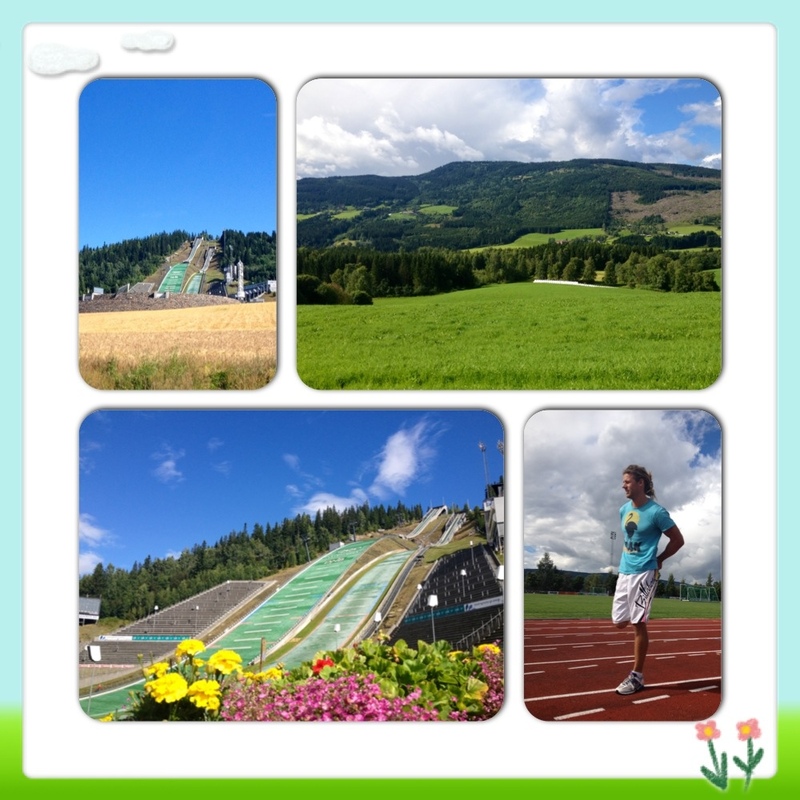 Lillehammer was host to the winter Olympics in 1994, so we are driving up to the well maintained ski jump and athletics track. Logan even does three 800m rounds on the track and I time him. Next time I’ll bring my “cheerleader pompoms”! Eventually we drive on to Oslo and the find-a-carpark game starts all over again. We are driving back and forth, doing u-turns, searching, looking.. THERE! What’s this? I can’t read the sign and get out to translate it. Within 5 seconds a bus arrives and angrily beeps the horn at us. I run back to the van and the game continues. We decide to leave the city centre and drive west. There actually seem to be streets in which no parking tickets are required. Since the sun is still out, we get the bicycles and ride back into town. Flowers are to be found everywhere throughout the city which I personally enjoy looking at very much. 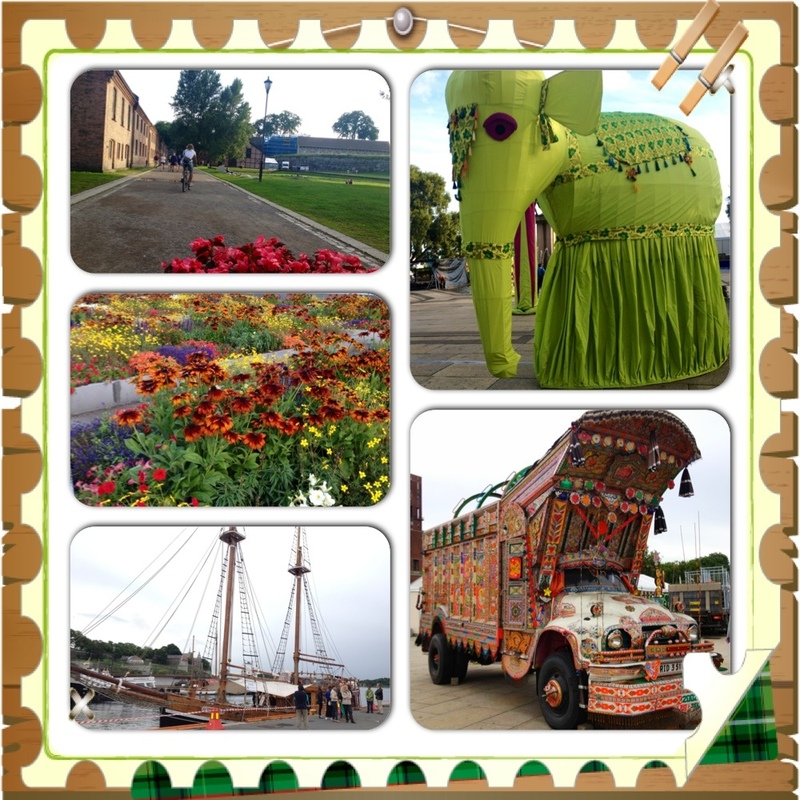 The colourfulness of the city continues along the harbour. A very colourful Indian bus is displayed at the front, along with a young boy playing the drums, a guitarist, fairy tale figures and green elephants (which I think are part of a music festival). The port also has a small beach and grassy area to relax or enjoy the day with the children. I noticed a lot of young women have children here, probably because Norway is said to be the most child friendly country in the world. The best surprise of the evening are the swing dancers who probably belong to a dance club. We keep watching them for quite a while and I keep laughing and smiling at this genius dance style. Some people even wear old fashioned clothes. I really want to join a dance class now! 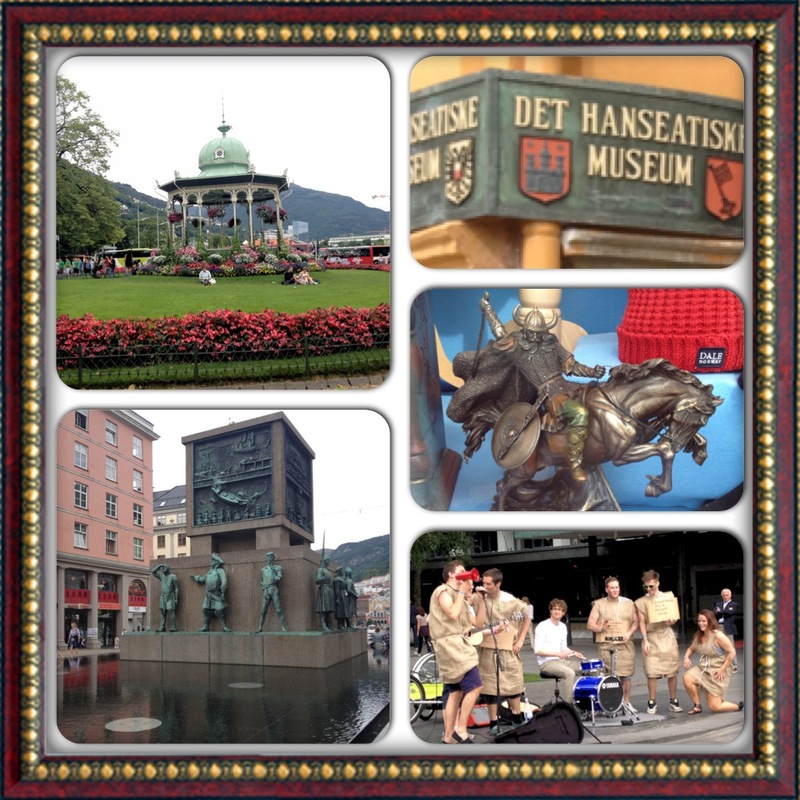 More on the fantastic Oslo Museums in the next post! 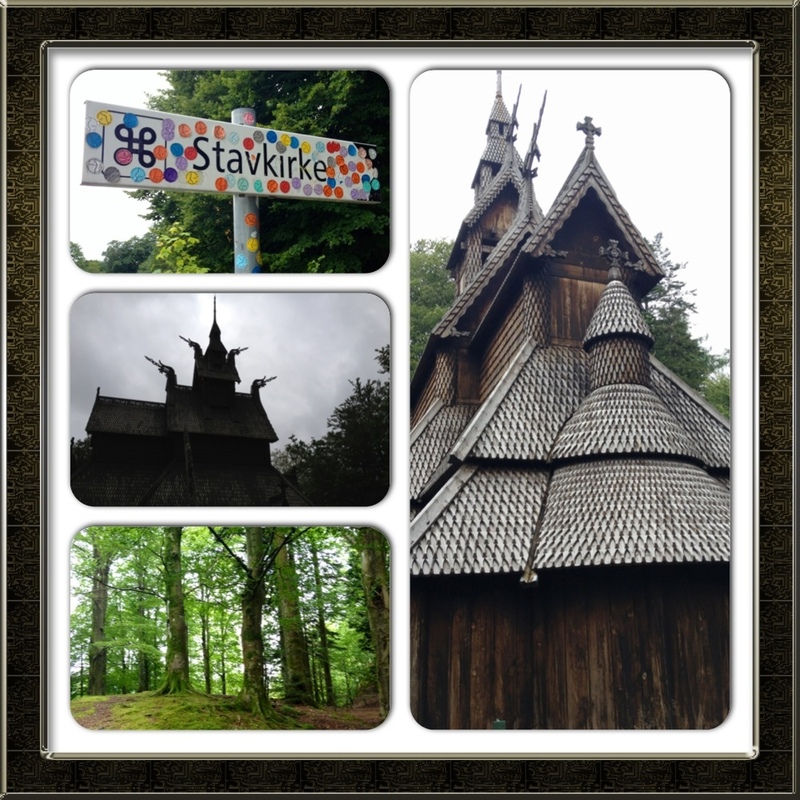 After 2 days we are leaving Bergen but not without seeing the stave church (a wooden church built by the Vikings). 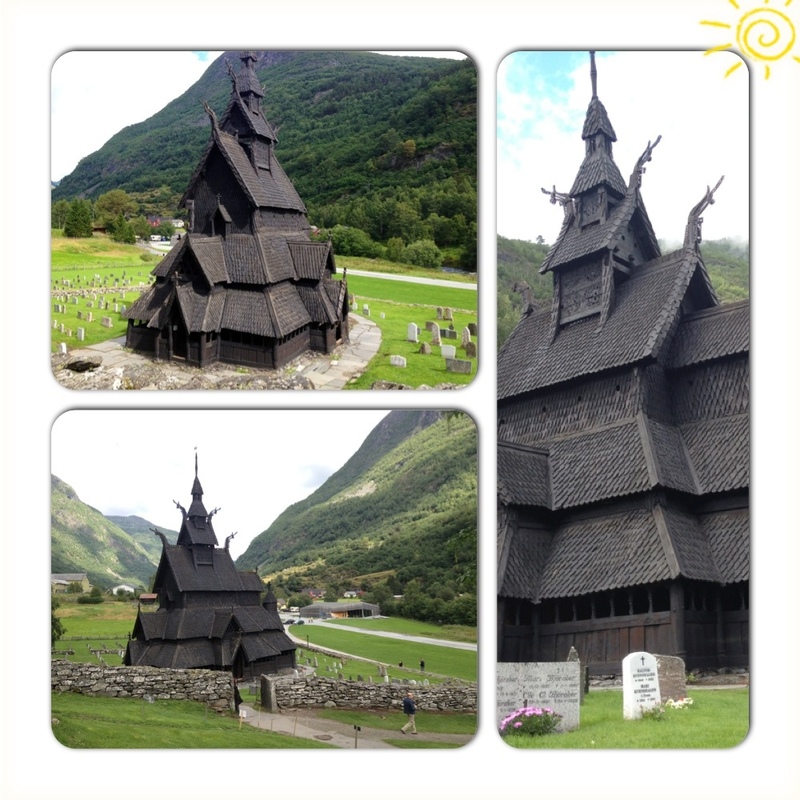 There are 28 stave churches in the country but this one is going to be our first one. Unfortunately it is not original anymore but has been rebuilt. Driving along road 16, we pass the Tvinnefoss, a majestic and very impressive waterfall. It has been raining a lot last night so there is a vast amount of water coming down. At the tourist shop I then find a postcard of the waterfall in winter: completely frozen!!! Absolutely amazing. We also buy some more lures to be able to go fishing in lakes as well. Before Gudvangen we spend the night at a lake but again Logan doesn’t catch any fish. 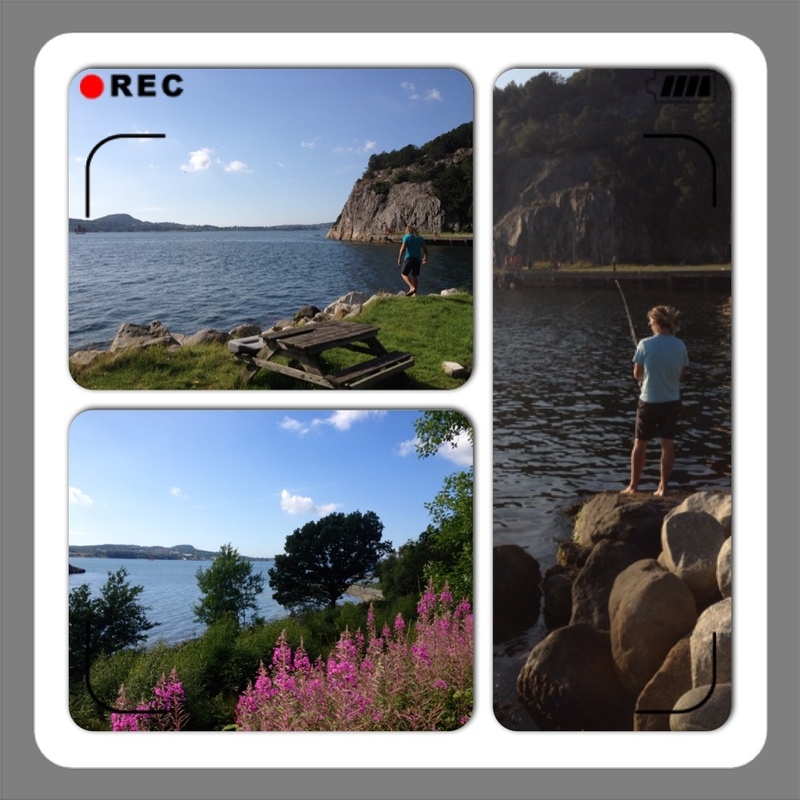 This lake may actually be too far away from the fjords and only have smaller fish…? 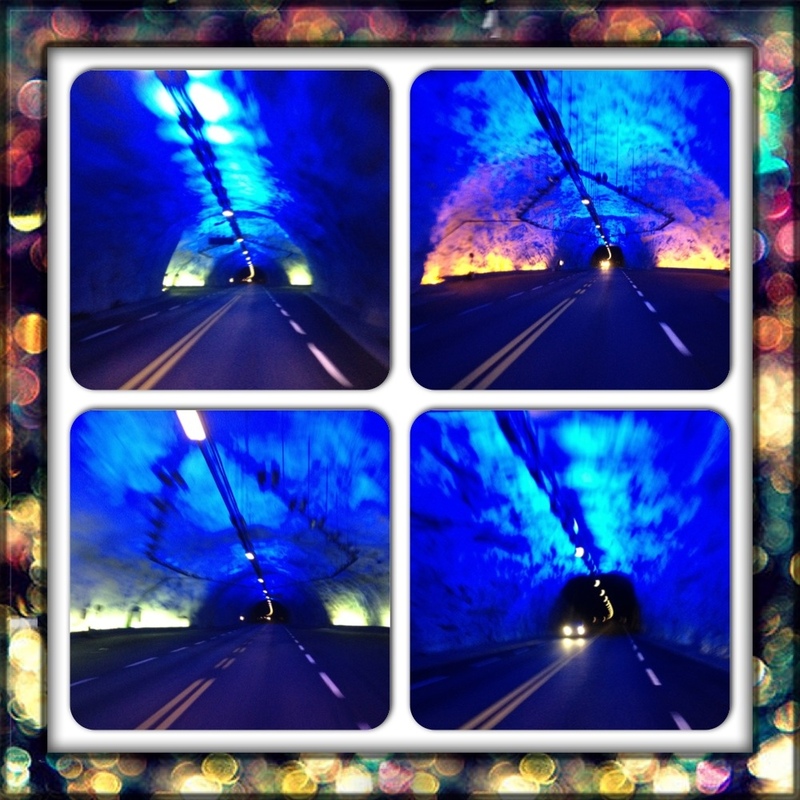 The next day we are driving through the world’s longest road tunnel. 24.5km of boring blackness? No, when you make it to quarter, half and three quarters of the tunnel, you will see a spectacularly lit up part of the tunnel, reminding me of an ice cave. After the tunnel we take a right turn to get to Borgund where one of Norway’s oldest and best preserved stave churches is located. On the way we drive past a former excavation site where Viking combs, jewelry, keys and other objects have been found when building a new road from Bergen to Oslo in 2009. Eventually we turn around, taking the historic route, and cross one of the many arms of the Sognefjord with the ferry, to get to Jostedalsbreen National Park, the place with the largest glacier on the European mainland. One of the many glacier tongues is the Nigardsbreen glacier. The last part of the road is actually a toll road, we pay 30NOK and get there just in time before sunset. Unfortunately the sun is only still reaching the mountain peaks, not the glacier anymore but we still get to see the fascinating shades of blue in the ice. A raging current is coming out underneath the glacier, forming a lake. 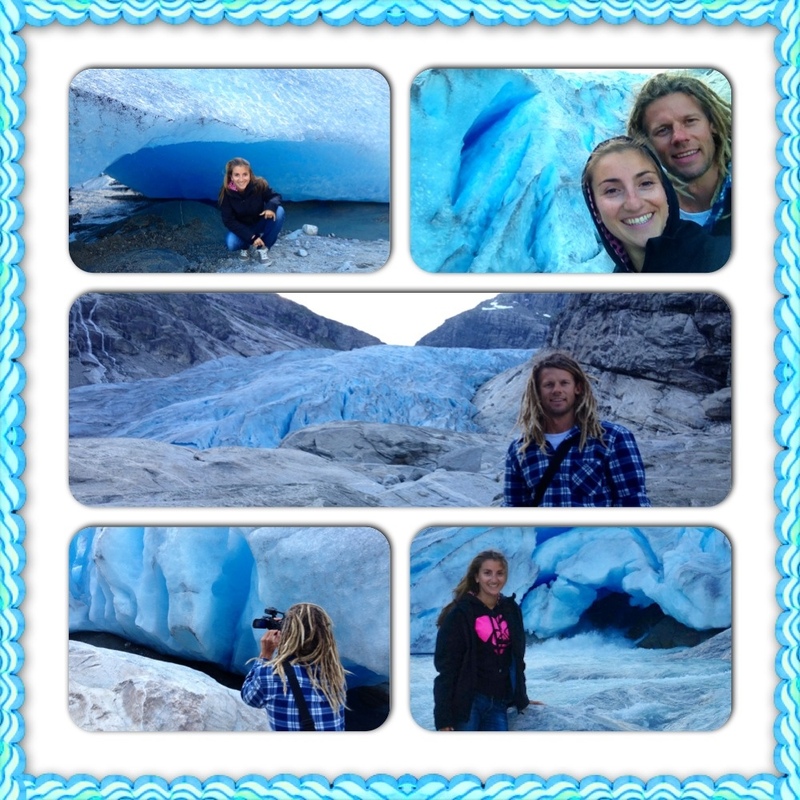 The glacier was measured to move up to 1.5m downward per day, therefore it is not the safest place to be in. We take some footage and enjoy a few minutes of looking into the icy blue colours of the giant before we have to leave. 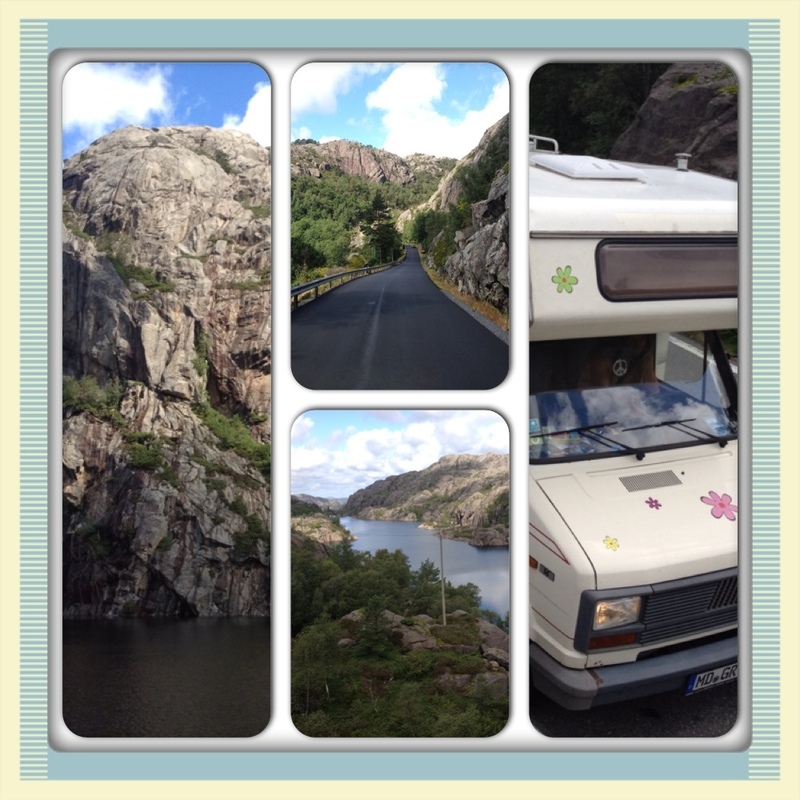 After finally having caught the ferry, road 7 to Bergen leads us along the Hardangerfjord, with 180km Norway’s second longest fjord which is not only popular for its sheer beauty but also for the many fruit trees along the shores. 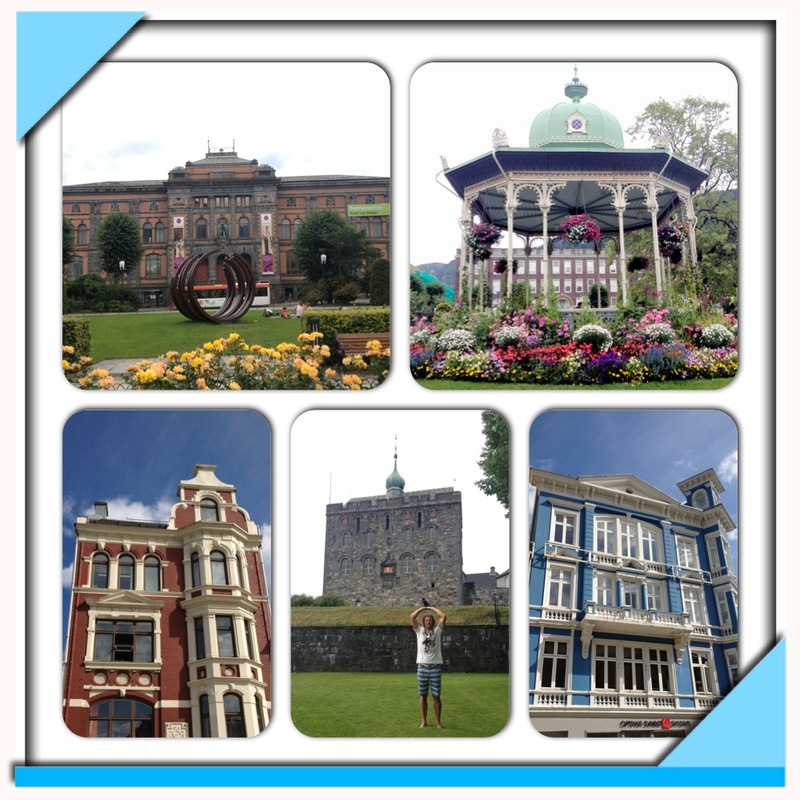 We drive past many pretty villages before eventually arriving in Bergen. When leaving to explore the city, we realise how much our waste water pipe is actually leaking. Since we are parked on an angle, water is running down over the car park and into a gutter. Logan tries to fix it but instead a much larger volume of water bursts out before he can attach it back on. Oops, I guess we need to buy some sealant. 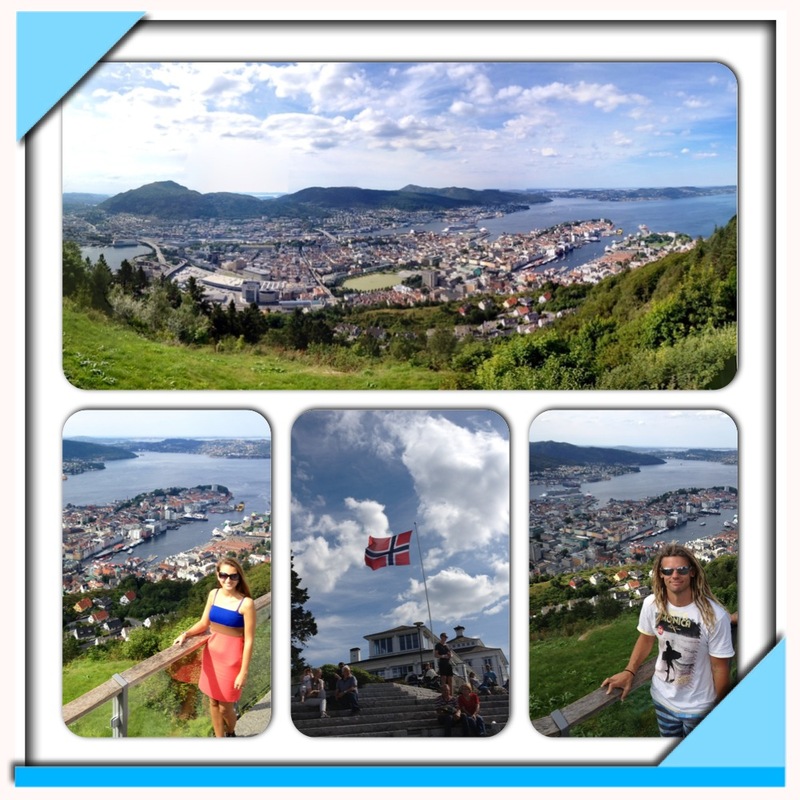 In Bergen our first destination is the Floibanen (www.Floibanen.com) which takes us up a hill from which we get to see all of Bergen city including the surrounding fjords. The price one way up per person is 40NOK (4,50EUR or $6,50). 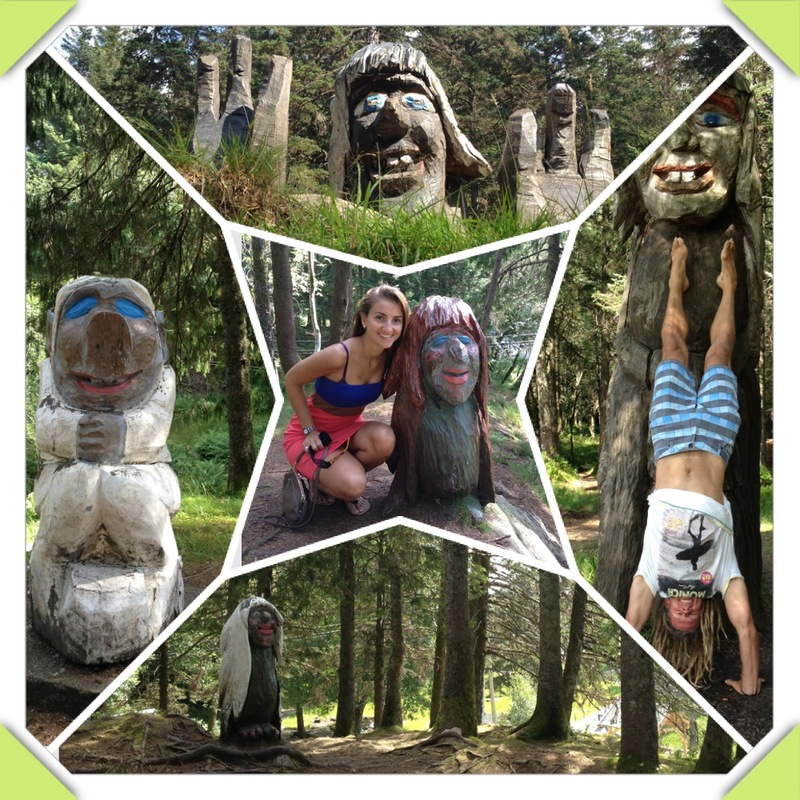 We choose to walk back down, a good decision as we come across a real troll forest! 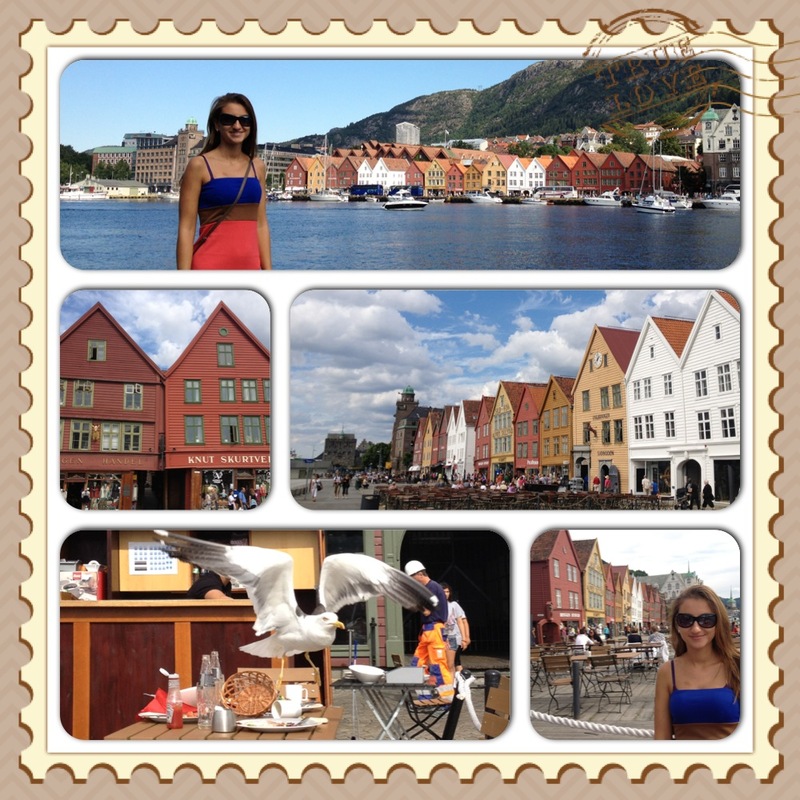 Back down in the city, we walk along the hanseatic Brygge which is part of the UNESCO world heritage sites. We are sitting down for lunch and a drink at one of the beer garden-type restaurants outside and enjoy the sunny summer weather overlooking the port. 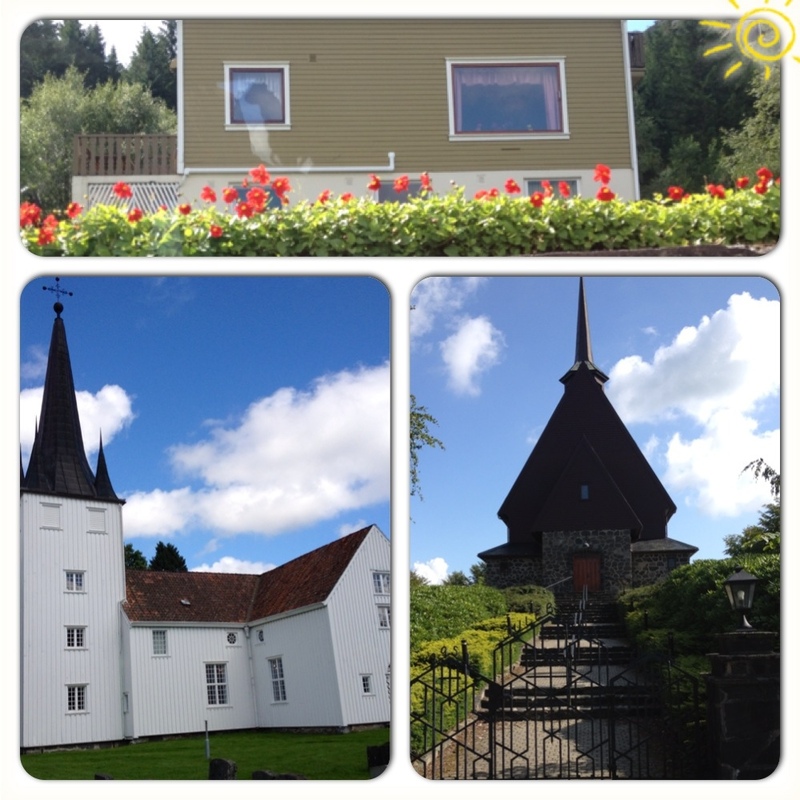 Nearby are the Bergenhus Fortress, the Mariakirke (church), shops, fish markets and also tourist market stalls. Eventually we get to the city centre and to the lake Lille Lungegardsvannet and this beautiful flower pavilion. Some students seem to have their graduation today and we keep seeing themed groups of young people running around in the streets, cheering and dancing everywhere. I also finally register my Telenor SIM card, only to find out afterwards that Telenor has changed prices and I’m strongly being recommended not to use internet with this sim card, as it is too expensive. What a waste of money, don’t buy Telenor! I stick with my German Vodafone sim and the 2EUR for 25MB packages per day for the rest of our trip. 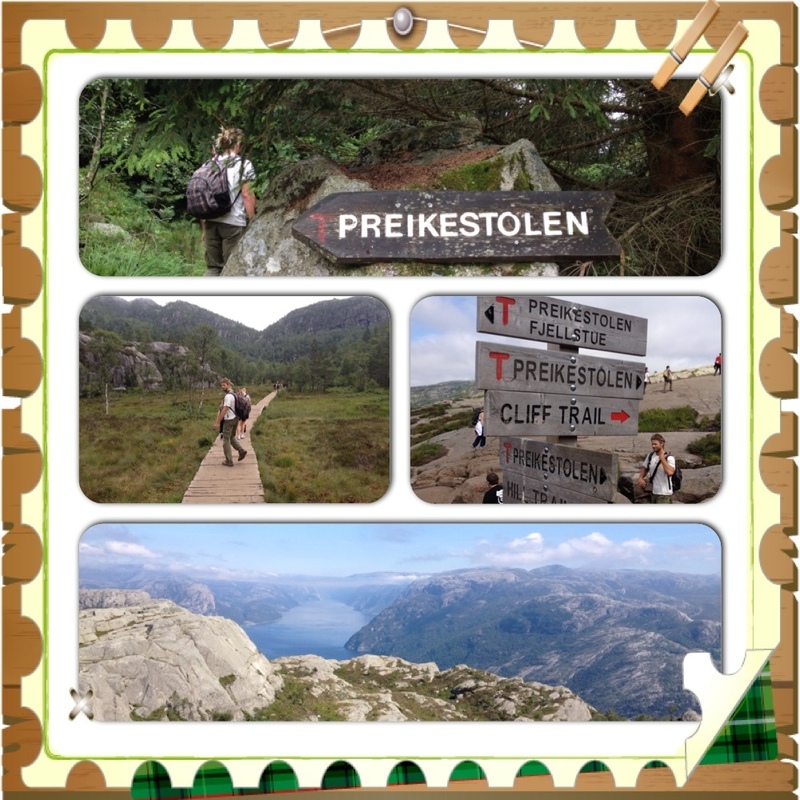 After the long and difficult trek to the Kjerag Bolten, we have had two lay days to recover and regain strength for our next adventure: The Preikestolen! 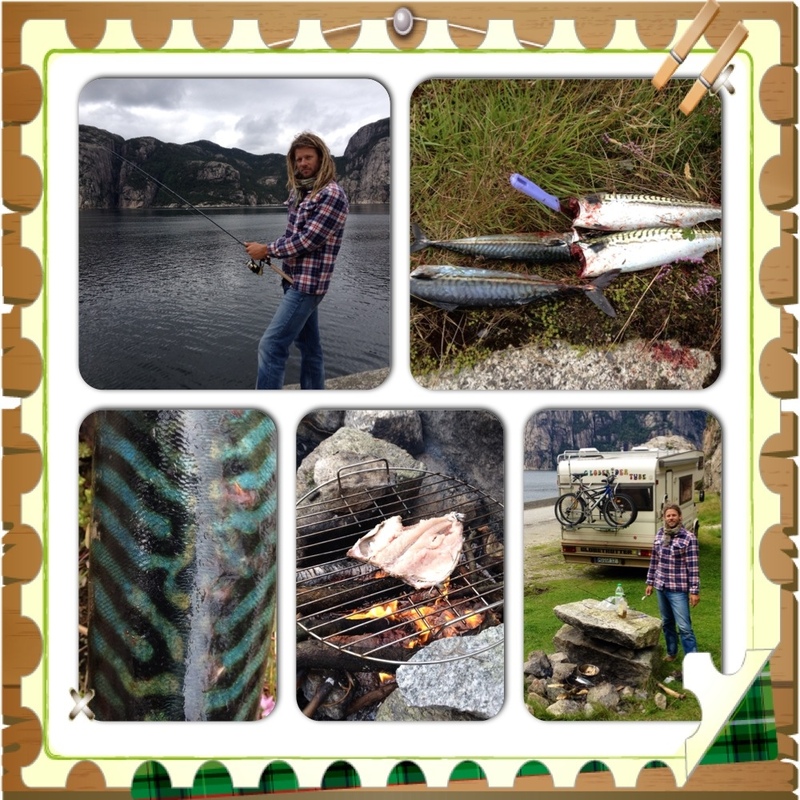 During those two days we have been enjoying beautiful views at the Lysefjord and tried some more fishing. Since I’m never lucky fishing, Logan of course caught four(!) Mackerels during the first 30 minutes, when I wasn’t there yet. 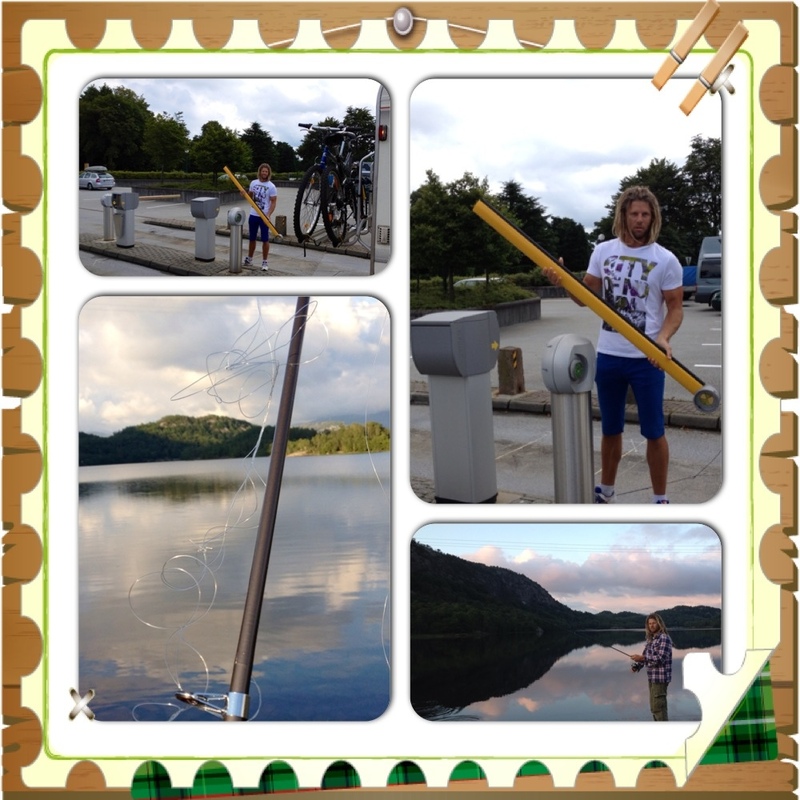 The next hour of fishing with me present is unsuccessful – I’m not surprised anymore. Instead we catch a jellyfish and I upset some kind of marten when reeling in the fishing line and accidentally smacking him with the bait. Oops. He’s hissing at us a few times and then tries to charge us up the rock but then disappears. Four Mackerels should really be enough for the two of us anyway, so we get the fire going and prepare the fish to be cooked. Oh and we are not professionals in preparing fish, so we just cut it apart and take out the bones once it’s cooked. That works well enough for us. 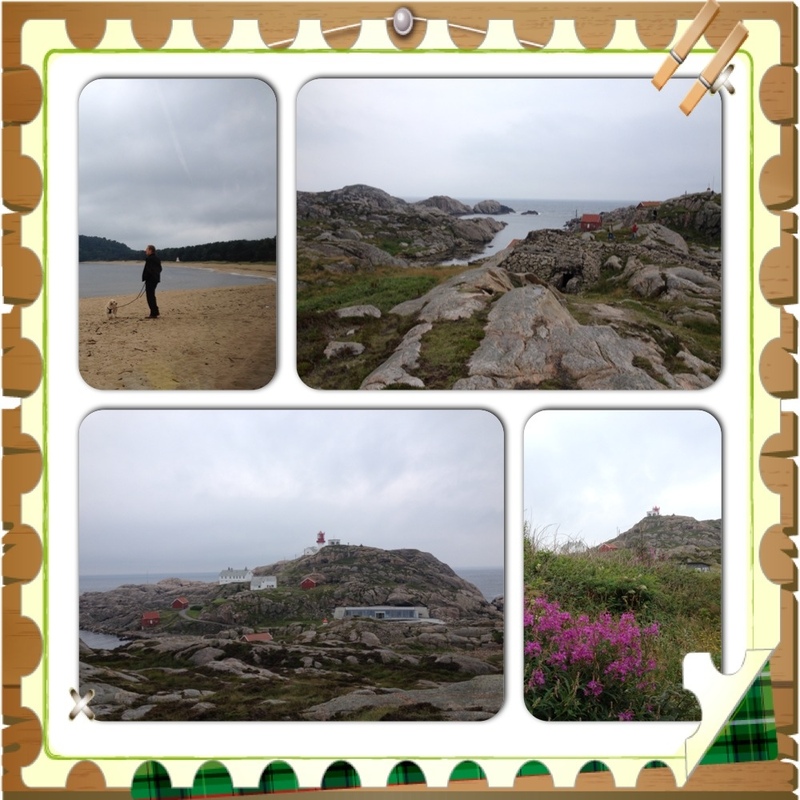 On the second lay day we stop in Forsand to go shopping for some basic groceries before driving on to Preikestolen. Our plan is to camp nearby so we can start the walk early in the morning. Unfortunately there seem to be so many tourists coming here, that wild camping is not allowed nearby, so we have to drive back to the main road and stay there. Even though the weather forecast has been predicting sun, we wake up to a thick layer of grey clouds. That’s demotivating as obviously you need to have good weather for the best views from the Preikestolen or “Preacher’s stool”. We don’t want to waste any more time though and make our way back up to the car park: 100NOK. Wow! This is not even the main car park near the restaurant, since that one is full, they opened another car park another couple of km down the road. To still ask for 100NOK is a bit much. We turn around and park up a little further down the road and get the bicycles out – cheeky I know. We ride down to the restaurant and main car park and lock up our bicycles here. The trek immediately starts off with a rocky path, turning into boulders and holding on to trees or rocks with hands is necessary in parts. We cross several streams, grasslands and steep walls on the way. I’m surprised to see a lot of children on this track, partly climbing themselves and partly sitting in a backpack on daddy’s back. A lot of people also take their dogs and it amazes me how they manage the steep climbs and balancing on boulders. After about two hours of hiking the skies have turned into a crystal blue and we finally arrive at the Preikestolen – I haven’t seen so many tourists in one spot in a while! Wow! Logan and I look at each other with big eyes and have the same thought: would the Preikestolen break off under the weight of all these tourists?? There’s already a large crack through it, especially visible from above. 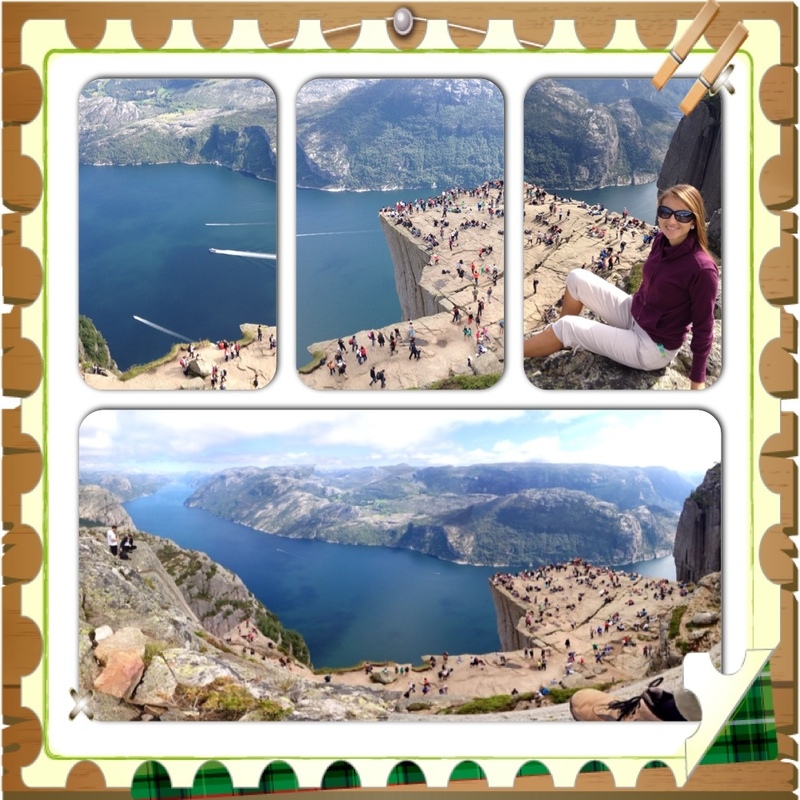 We first try to take in the incredible views over the fjord and at the Preikestolen before actually making our way through the people chaos on the platform. 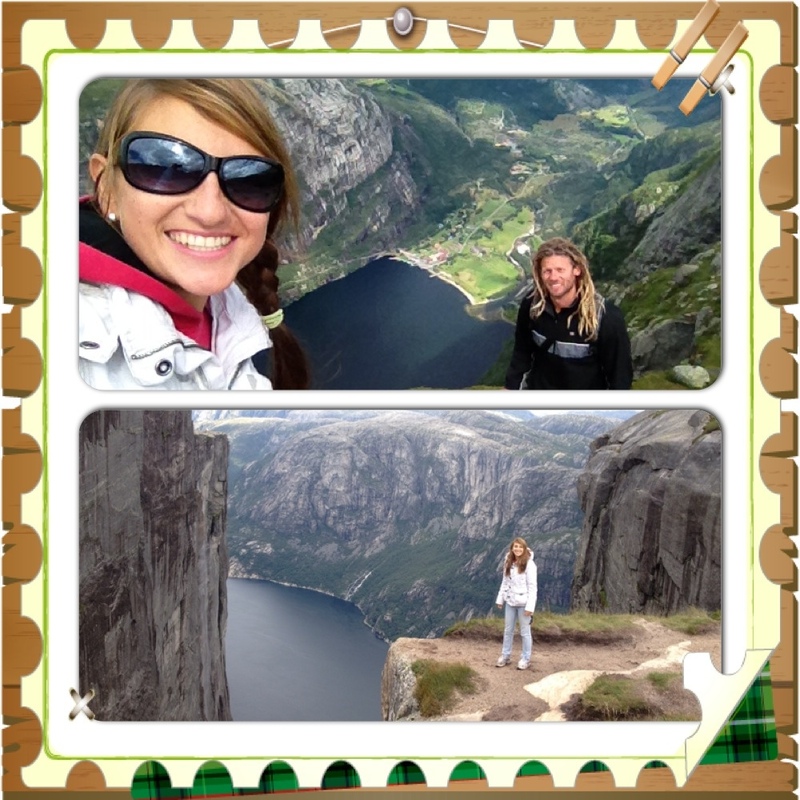 We get a few shots and have lunch, sitting on the edge, overlooking the Lysefjord. 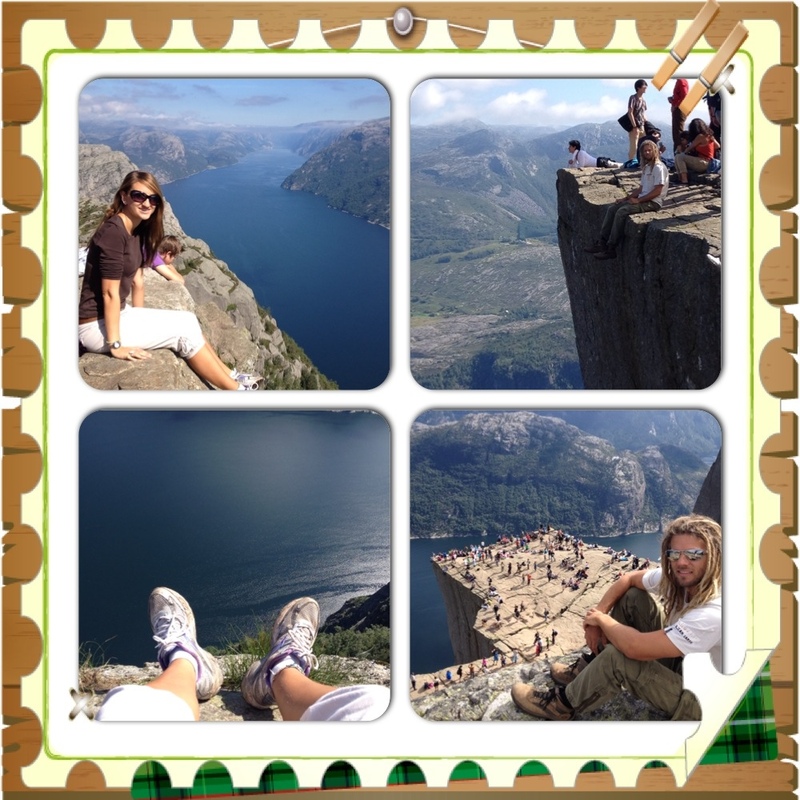 Then we climb up even higher, so we can see the Preikestolen and the Lysefjord from above. It’s such an amazing view! Then it’s time to make our way back. 1.5 hours of walking downhill and jumping from rock to rock are ahead of us before finally reaching the car park. I brought shampoo and fresh clothes and clean myself in the bathrooms while Logan is getting the Globetrotter van to pick me up. He then also has a clean and we make our way north. 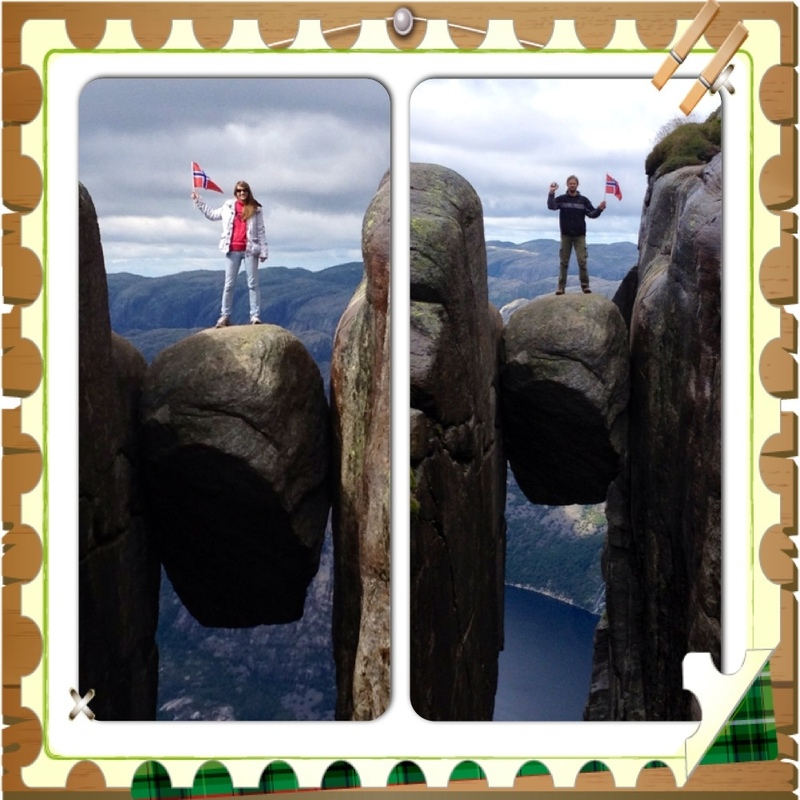 At the Preikestolen bus stop we see a young couple holding their thumbs out. “Where do you guys need to go?” I ask. “To Tau. Our ferry leaves from there!” she says. Turns out there hasn’t been any buses coming in a while and they were already a bit late. We give them a lift to Tau and then make our way towards Hjelmeland, spending the night at a nice spot on the side of the road. There are stone tables and chairs here, so we enjoy beautiful views over the valley while having dinner and then playing a game of chess. After Logan’s 40k(!) 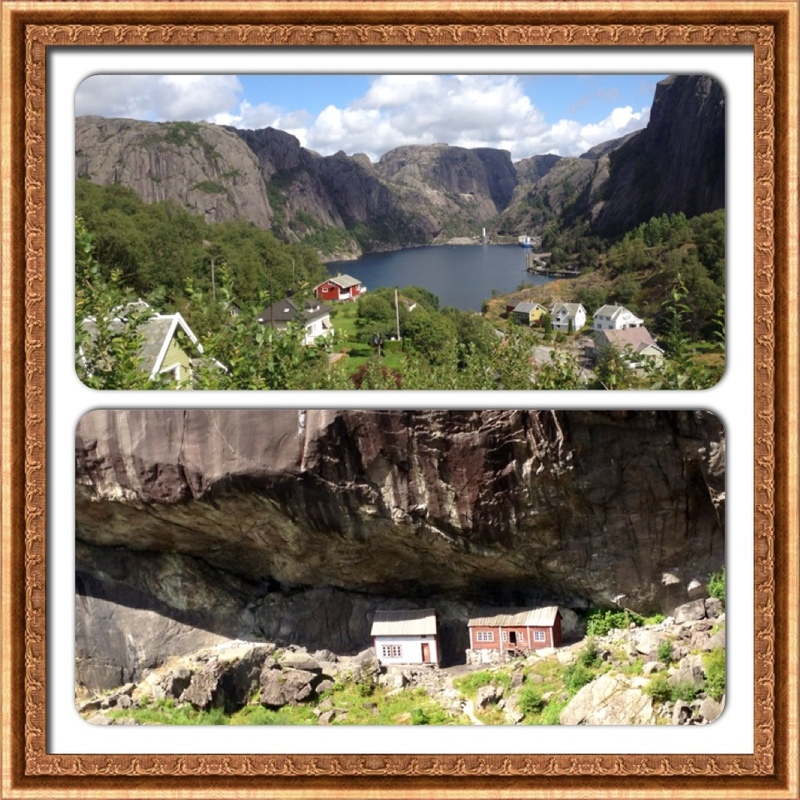 run yesterday, we are off on the big Kjerag Bolten adventure (pronunciation: Sherag). 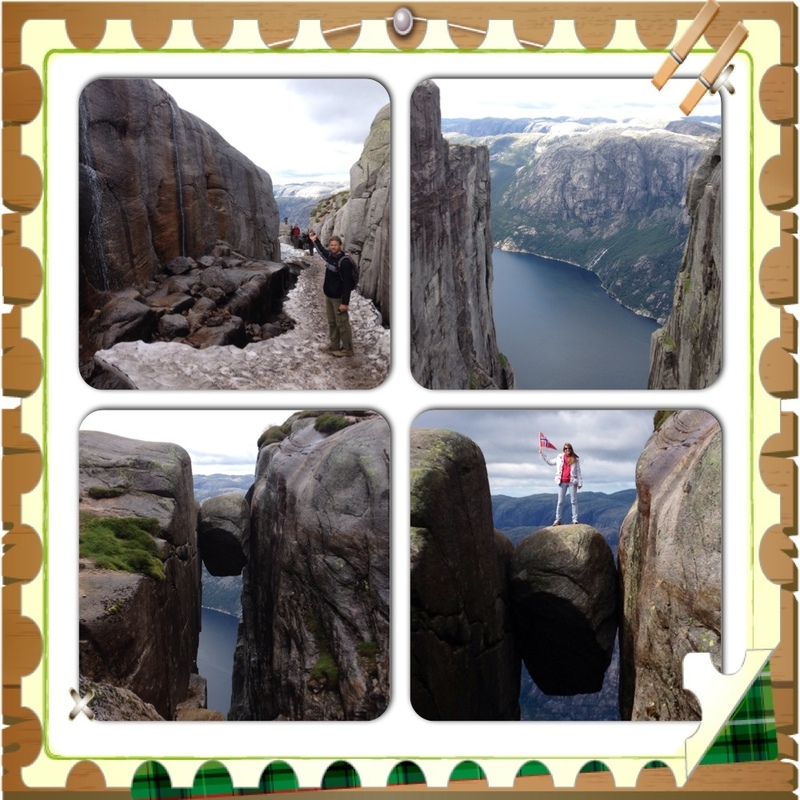 The Bolten is a boulder trapped inbetween two rock walls; it is suspended over 1000m above the Lysefjord. 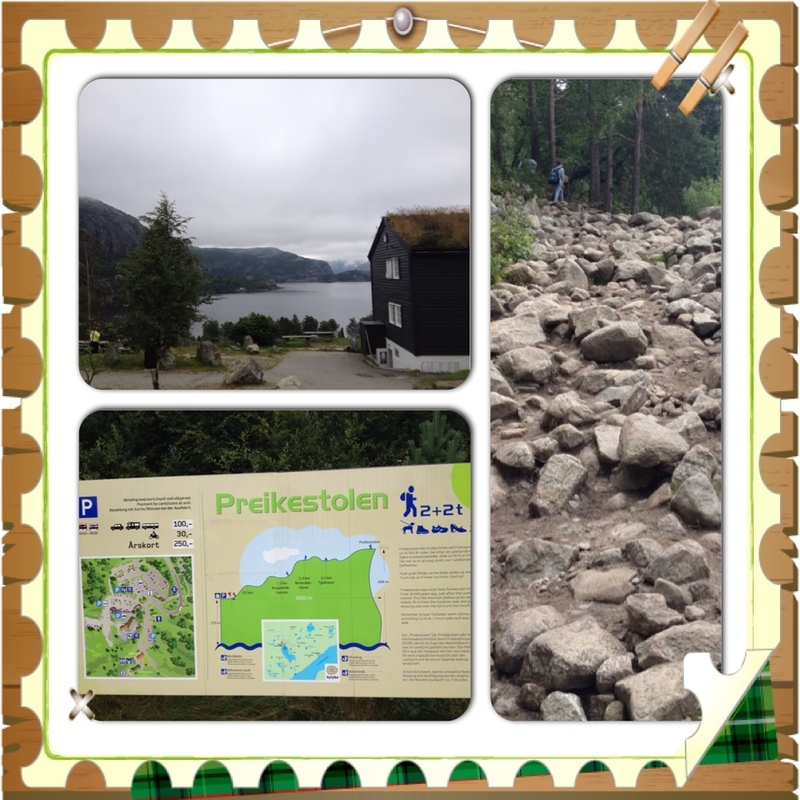 To get to the Bolten, you start the walk from a restaurant up the serpentine road from Lysebotn. Whether you get there with your own car, book a bus from the camp site in Lysebotn or hope for a hitch hike from the cars on the ferry. We got here via the long southern road along the fjord. For photos please see previous blog post. The parking fee for the day is 100NOK which is over 10€ or $16. You can pay in the restaurant. There are toilets and showers provided but at the end of the walk I have to find out that the showers (which are an extra 10NOK) don’t even work. I’m very disappointed about that looking at the overpriced parking fee that is “supposed to help maintain the car park and facilities”. The walk is rated “very difficult”. After a few meters we have to make our way up a steep and sometimes slippery mountain. There is a chain fixated to the ground so hikers can hold on for safety. I like treks like these with a bit of a challenge. Red T-markers sprayed on rocks lead the way but there is no actual track. The views are fantastic from the first mountain. The end of the fjord, the town of Lysebotn and the mountains are visible from here. After the first mountain the T-markers lead us into a valley (upper left photo) where we need to cross a creek via a wooden bridge. There is so much mud around, it doesn’t take long until I step in a puddle (to Logan’s delight) and have a wet foot. Oops. Proper trekking shoes would do a better job in this kind of terrain. To be honest, I was hoping that there was only one mountain to climb but standing on top, we could see there was a second mountain behind the green valley. Again the chains are helping the steep and treacherous way up but I’m getting exhausted and slow down Logan (who really should be more exhausted than me after his long run yesterday). 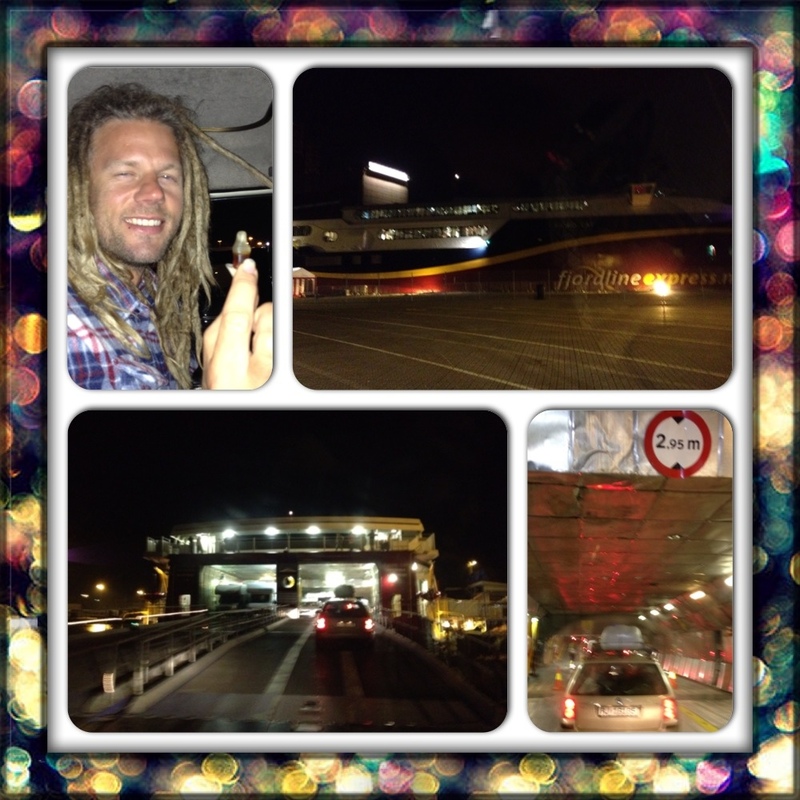 He get’s a bit impatient with me, trying to hurry me because he thinks we may not make the ferry in the evening. But hey, I’m not THAT slow! So on top of the next mountain, I realise there is a valley with a river and ANOTHER even much bigger mountain! It’s still so far away that the people climbing up, look like an ant colony to me. I’m uncertain about my abilities, especially because I can’t keep up with Logan anymore. He’s always about 50-100m infront of me, impatiently tapping his foot from time to time until I get closer again. until we finally reach the top. It’s gotta be the end! 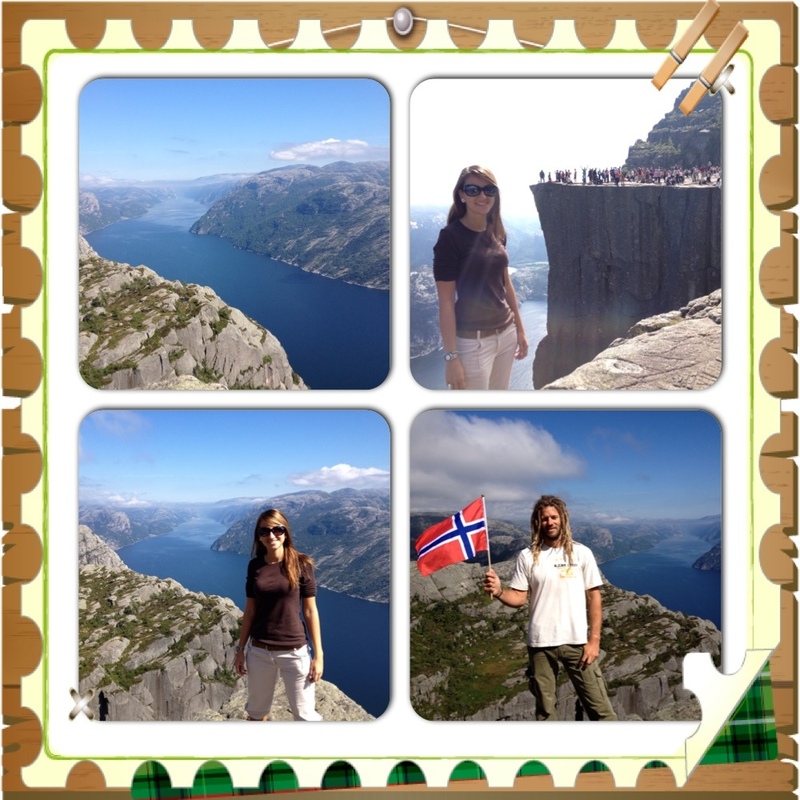 We must be at the Kjerag Bolten finally. And then I see ant-sized people again! Oh no!!! It’s not a mountain this time, just a long way to walk over a rocky surface with crevasses and even some meter thick snow in parts. 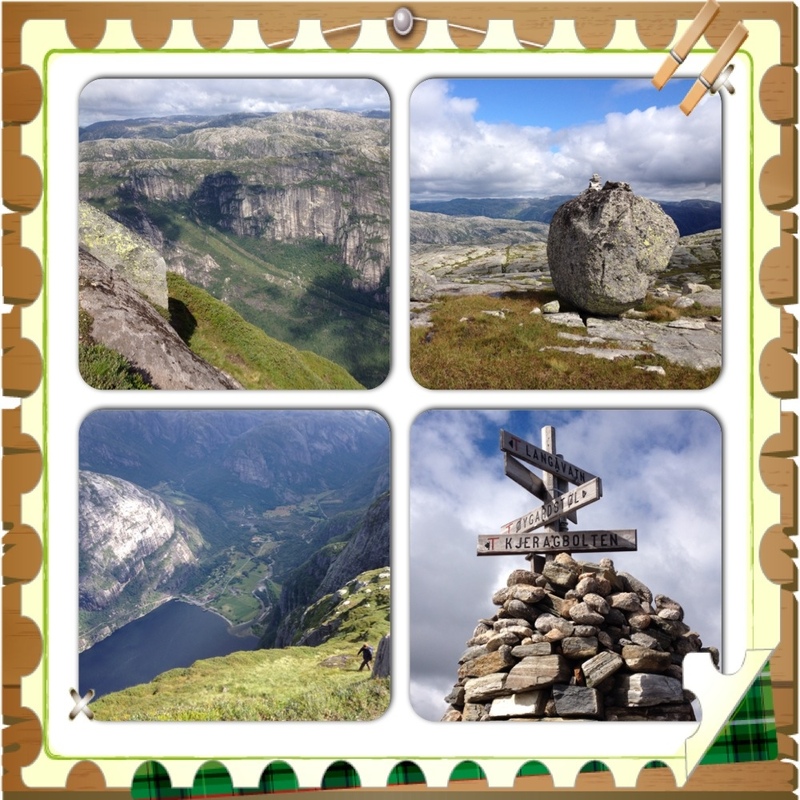 Tourist-made rock piles are decorating the landscape and a sign post is pointing the way to Kjerag Bolten. From the sign post it’s only a stone’s throw to the Bolten but the way down is precarious! A thin line of hard-packed snow leads through a crevasse towards the platform and the Kjerag Bolten. Right and left are big bolders below and falling or sliding off the thin snow track, wouldn’t be pretty. Walking very slowly over the very slippery snow, we make the crossing and get a first sight of the Kjerag Bolten. I immediately get an adrenaline rush thinking about going on the rock, as anyone here does, for a spectacular photo. Logan is first and coming back, he re-assures me, it’s not all that bad. There actually is a line up of about 5 people before its my turn. A young women gets dizzy and goes right down on her knees, leaning backwards onto another bolder. A young man reached for her hand to pull her back on the main platform. Right infront of me is a dad with his maybe 5 year old daughter who is slightly freaked out. I can’t blame her, I’m scared too! Looking down the 1000m chasm didn’t help much either. come to him that I gave him my phone. Wow that was exciting. We unpack our lunch and enjoy the view while eating. A few more photos and we are making our way back over all three mountains which takes approximately the same time or a bit less. My legs start to get weaker and I slip a few times, adding some more mud to my shoes and pants. Exhausted we arrive back at the car park and I check whether the showers are working but as already mentioned they aren’t! So we have to make do with the sink and warm water tab in the disabled toilet. Back down in Lysebotn, we are lining up for the tourist ferry to Forsand. The ferry is 640NOK = about 88€/$105 one way for two people and car/mobile home. The trip takes 2 hours and we get to see the steep rock cliffs of the fjord, a seal baking in the sun, the Kjerag Bolten from below (see in photo), several waterfalls and hear stories about the locals here at the fjord. 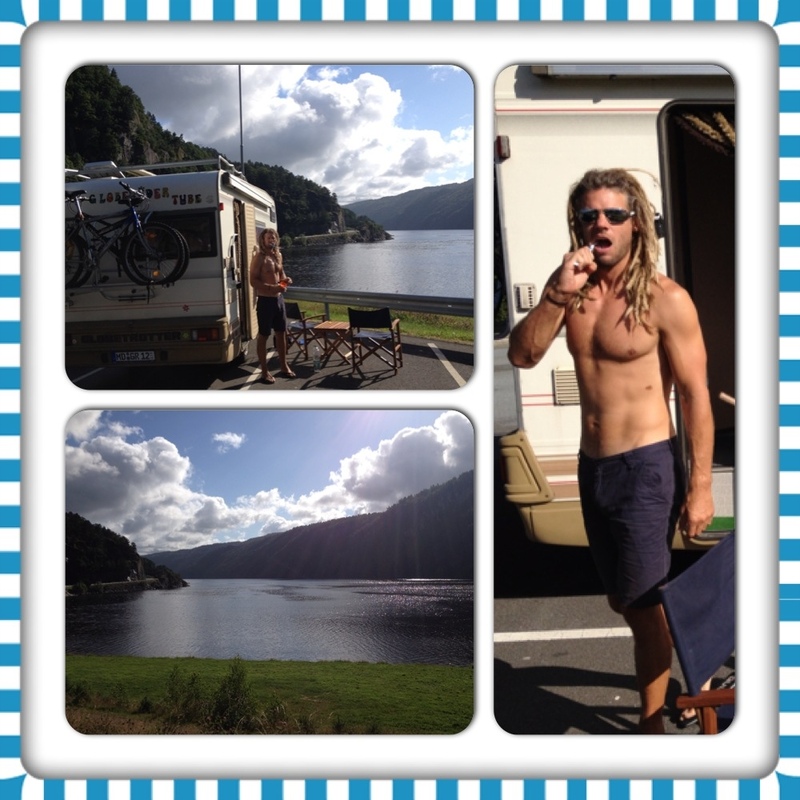 Arriving in Forsand, we find a perfect little spot to camp right at the fjord. 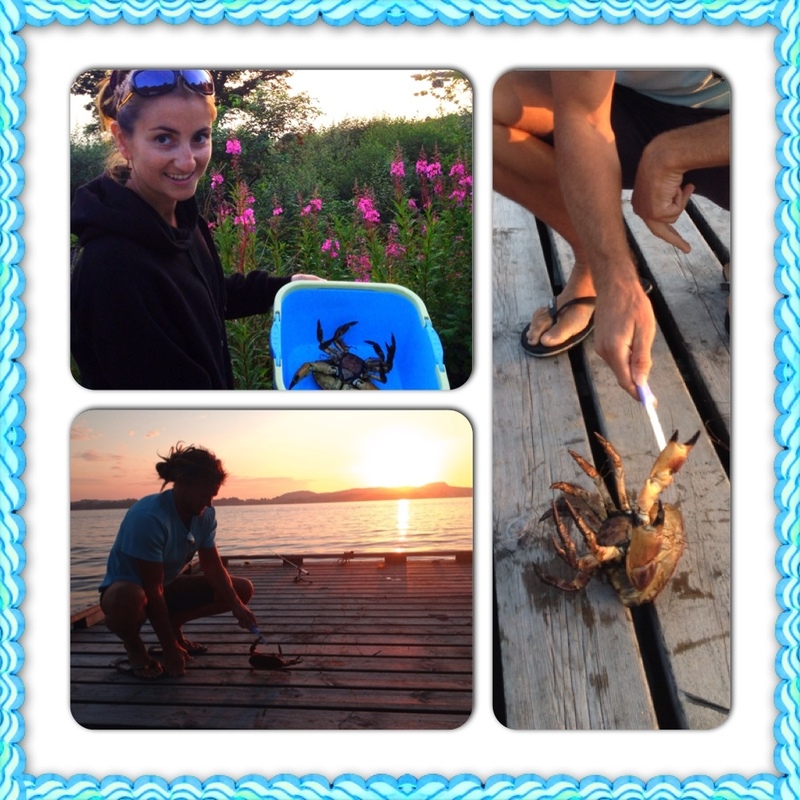 Tomorrow we’ll try our luck fishing again! 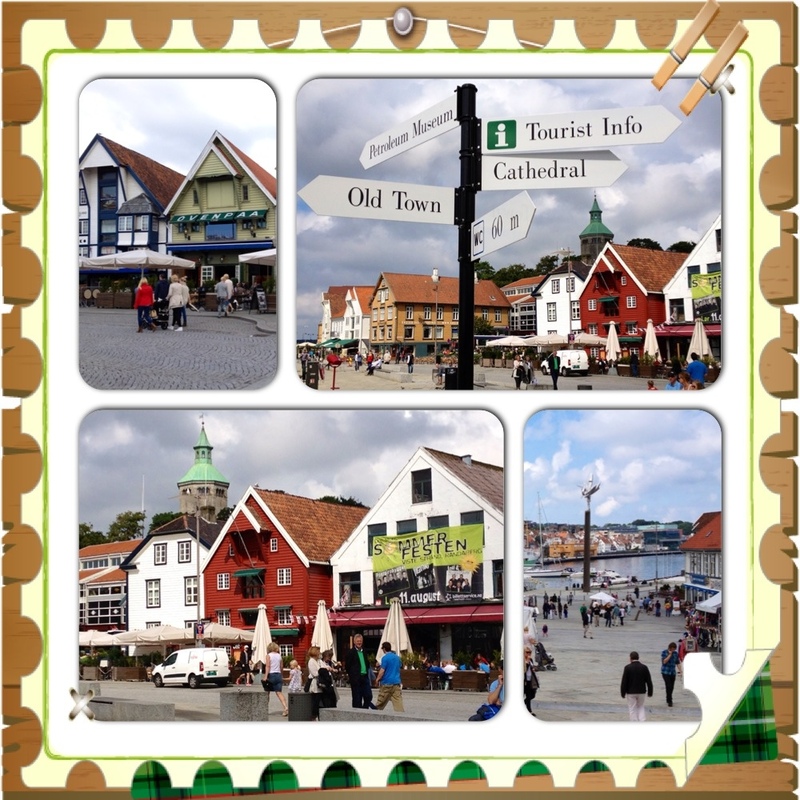 Arriving in Stavanger, we find ourselves a car park and go for a walk through the city. 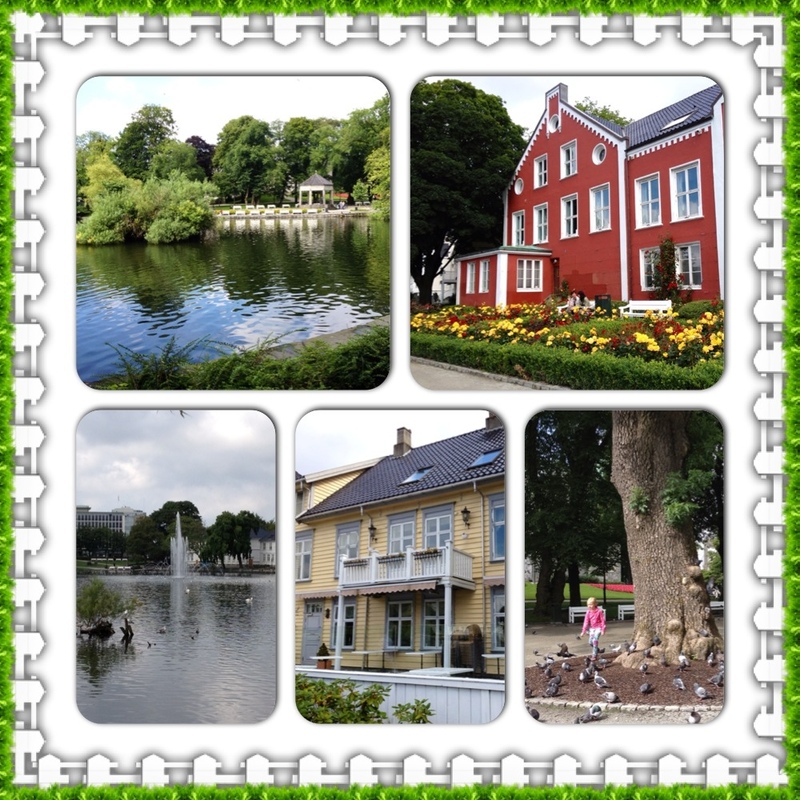 Surrounded by Norwegian style houses, we find a large lake with a fountain right in the city centre. 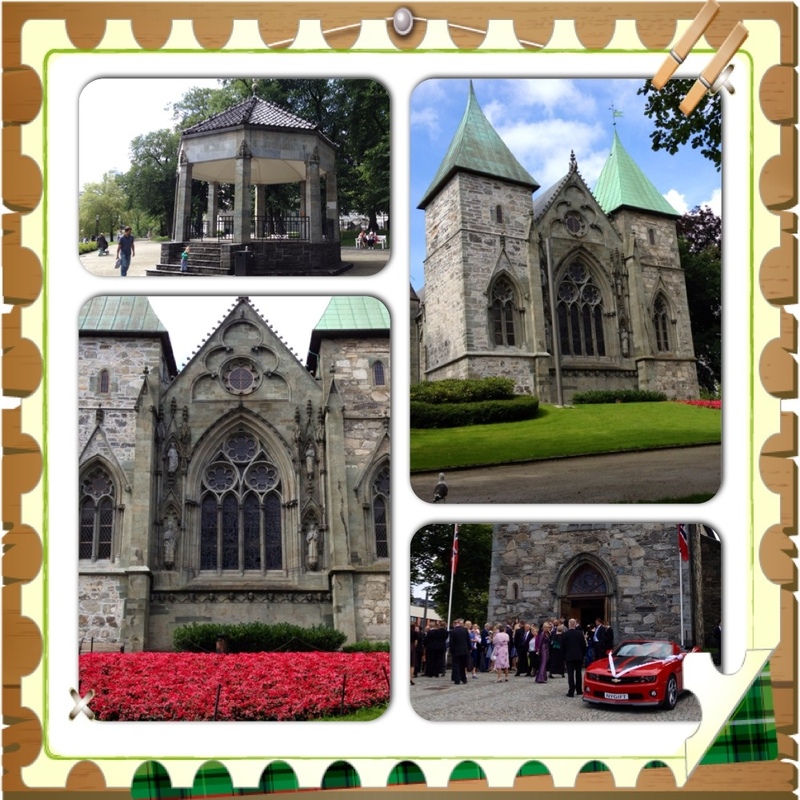 Nearby we discover a Gothic church and on the other side a wedding. We then follow our way down towards the water. There is a market with stalls selling Norwegian style pullovers, warm winter shoes, flags and much more. 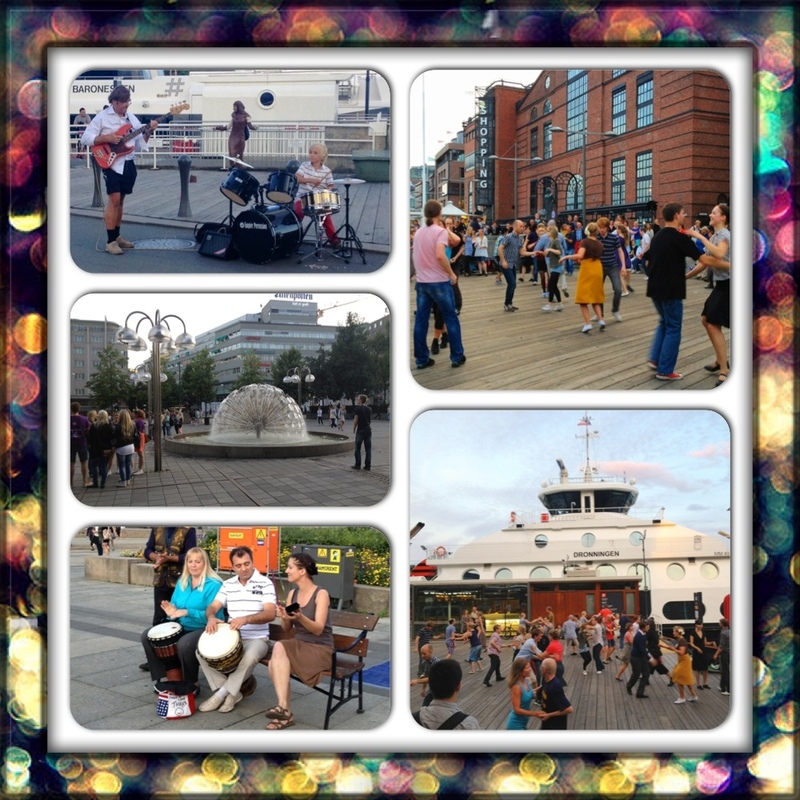 Pubs with music and outdoor seating areas are located along the port. I then discover a sign saying “Old Town” pointing left. That sounds interesting I think and we follow it up some steps and past some houses. 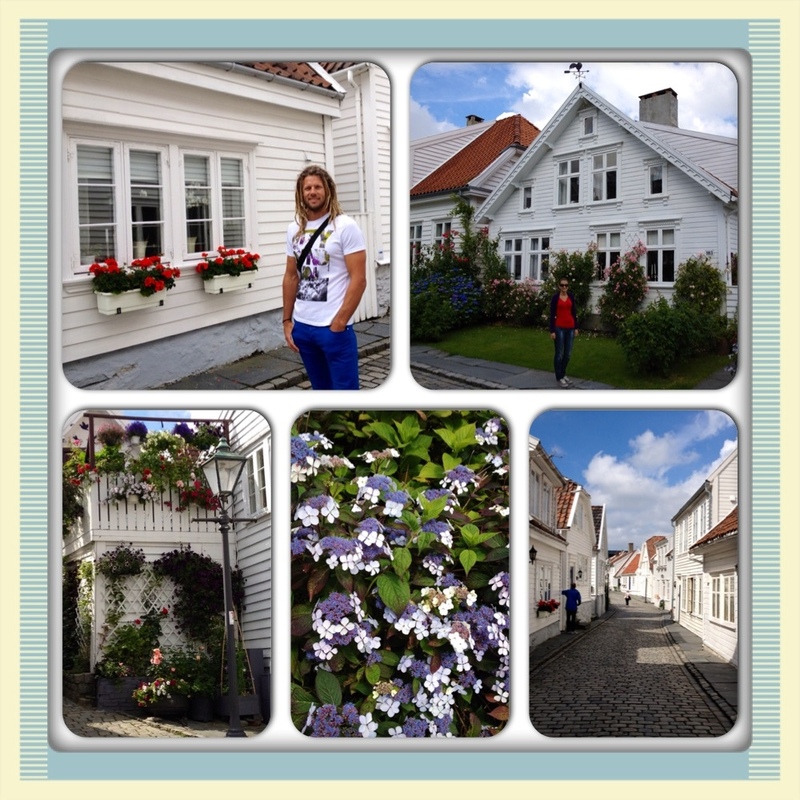 All of a sudden we find ourselves in a lovely old suburb of cute white wooden houses, decorated with flowers everywhere. The cobblestone street leads us past the “Can museum” and two girls selling waffles out their kitchen windows. What a lovely idea to earn some pocket money, so we decide to buy some. So do the tourists who watched us buying them in the first place. When returning to our mobile home, I pay for the parking ticket and we drive through the open boom gate, wenn all of a sudden we hear a loud noise of plastic dropping. “What the?!?!? ?” Jumping out of the van, we discover the boom gate lying on the floor. Now what? Run? Laugh? Call someone? First I check if there are any scratches to be seen on our Camper but the gate was only made from a light plastic. I quickly manage to take a shot, before we then just leave. No time for drama, we want to go fishing. And with fishing, another drama unfolds once again! The new fishing line we bought, seems to be too thick for my fishing rod and keeps tangling up badly. Logan then let’s me use his fishing rod for a little while and soon after I loose the rather expensive fish bait to the sea grass at the bottom. His fishing line is thinner and tears when I try to pull the bait out. How frustrating. Logan isn’t happy either, but hey, he lost two yesterday already! I give up for today and leave the fishing to Logan. After another hour or so, he throws out the line, gets somehow tangled and the bait goes flying into the lake! Another one gone. Disappointed we pack our stuff together and retreat to the campervan. Thanks for the fish Norway. It’s so warm! Half asleep I throw down my blanket and turn around one more time, but it is so warm up here in the campervan bed. Then I open my eyes and see sun rays peaking through the small openings of the windows. Sun!!! Finally after days we have sunshine! We pull out chairs and table and have breakfast outside, overlooking the Listafjord. 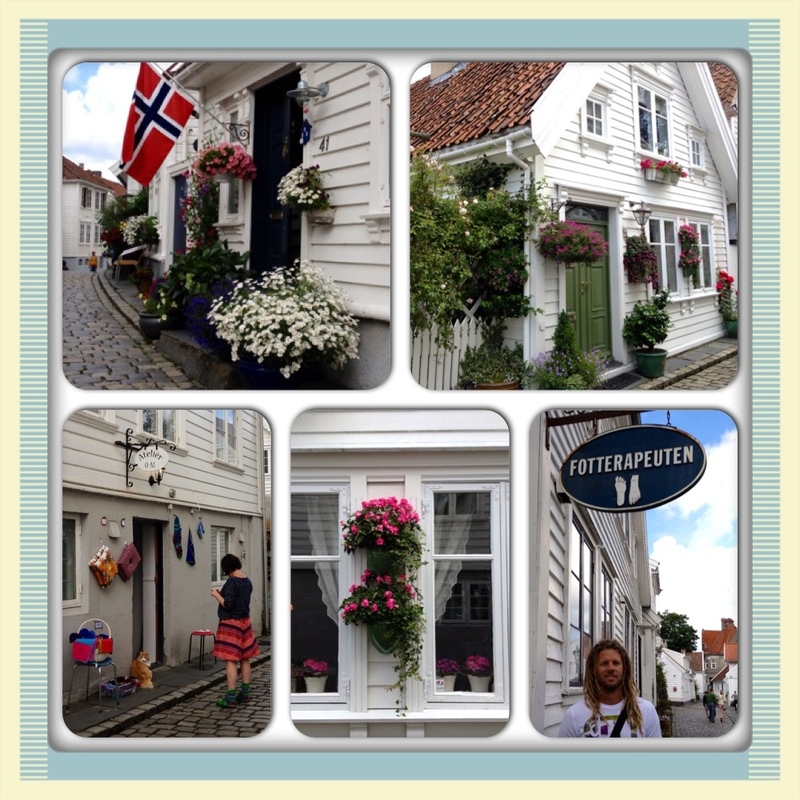 After passing through Flekkefjord, the street gets narrow, sometimes only 3m wide, and very curvy. 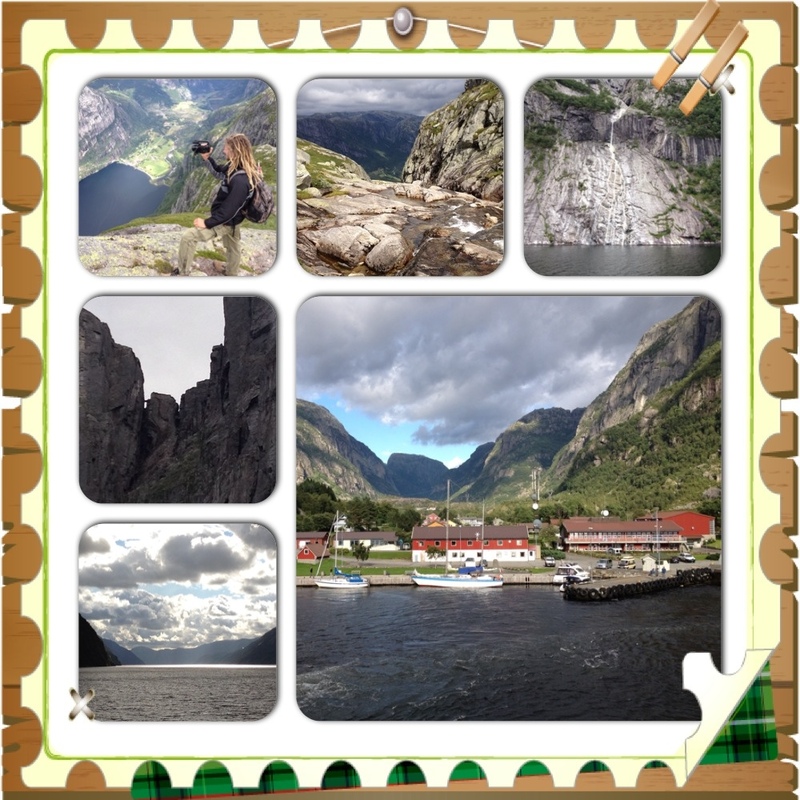 Going past deep chasms, cliffs, fjords and up to 400m-high and grey weather-beaten mountain scenery. I also tried to capture the beautiful and very unique architecture: from houses hidden below an overhanging rock wall (picture above), wooden churches or the typical idyllic Norwegian-style houses surrounded by large bolders, lakes and grazing sheep. sports store to buy some bait that may attract Norwegian fish better than our little neon yellow fish-bait. Logan also suggests we should buy more fishing line, as ours isn’t long enough. We go for the cheapest one which is still about 20€ and some stingsilda 28g bait for 10€. I read that one does the trick here in Norway. The landscape after Egersund is less mountainous, but instead a beautiful sandy beach borders onto hilly fields and forests. 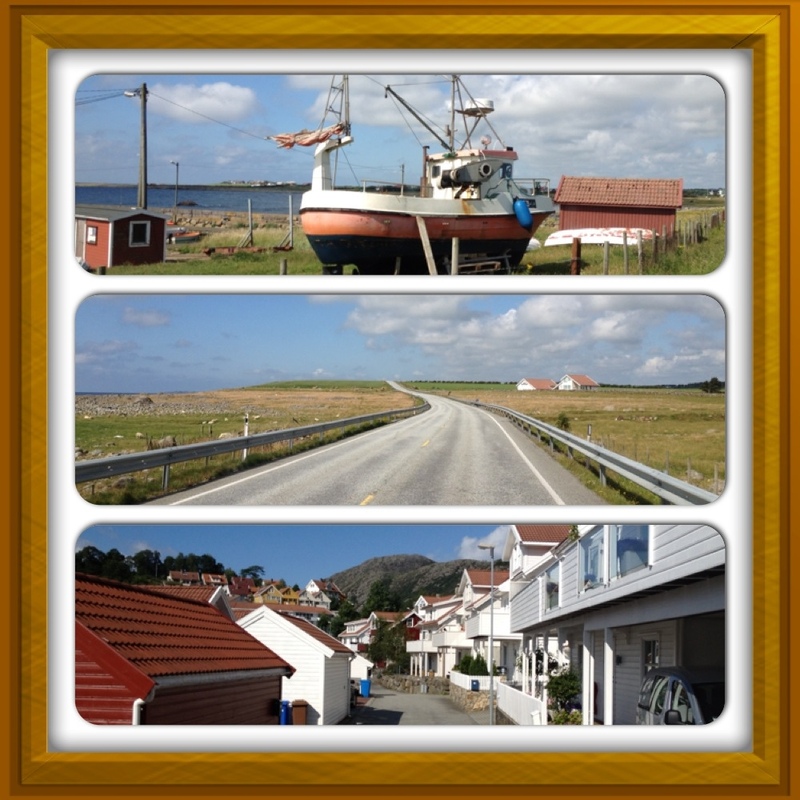 From Sandnes, near Stavanger, we drive east along the fjord, which I believe is still part of the Hillefjord and at the very end of the street we find a small village called Dale. 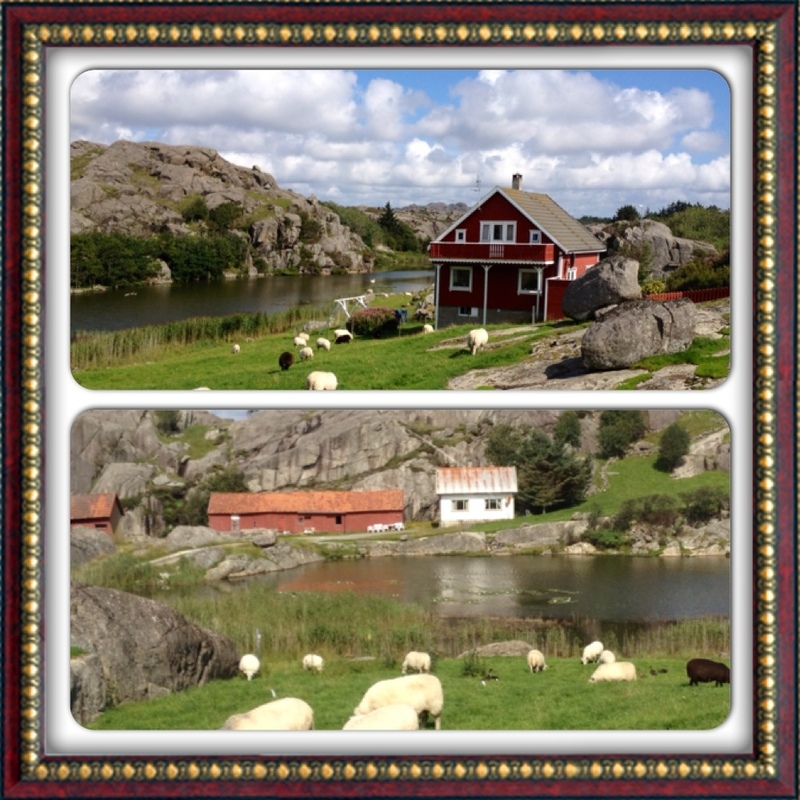 We are basically across the fjord from Stavanger. 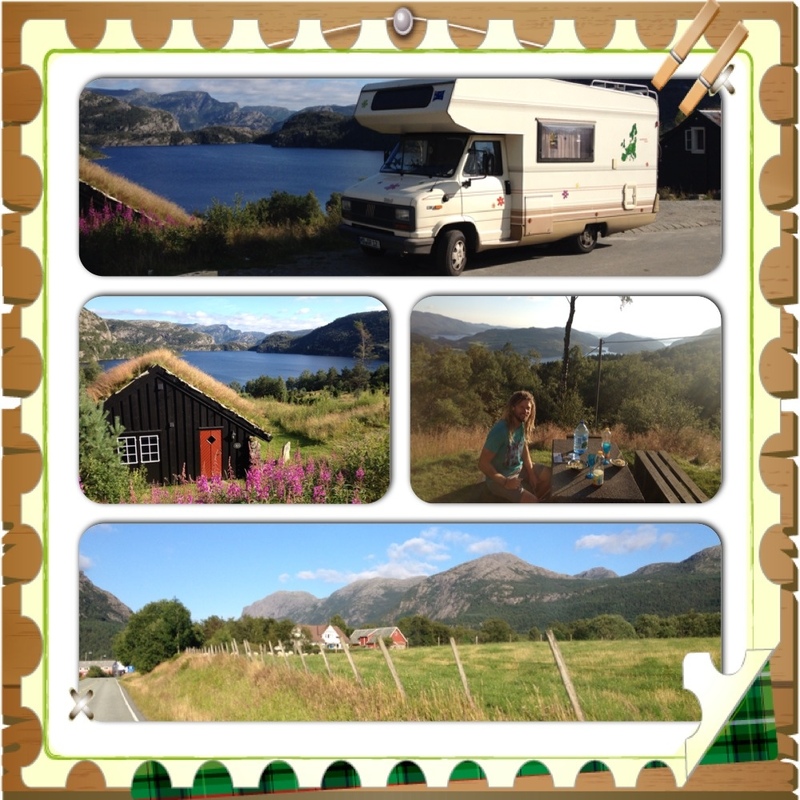 Here we discover a small grassy spot right at the fjord to park on. As soon as the engine stops, we excitedly jump in the back and unpack the fishing accessories. Logan is first in and within 10 seconds he has a fish on the hook!!! (This is no exaggeration!) I couldn’t believe it! He throws it in a second time and within another 30 seconds he’s got another one but this time the fish is putting up a fight and … The fishing line tears!!! I already had a feeling that the line was too thin when we reeled it onto the rod. Now this really is a problem. We lost one of the good bait and we don’t really want to loose the second one. Nor do we want the poor fish swimming around with hooks in their mouths. The second problem is, that even the front part of the fishing rod itself broke off too! 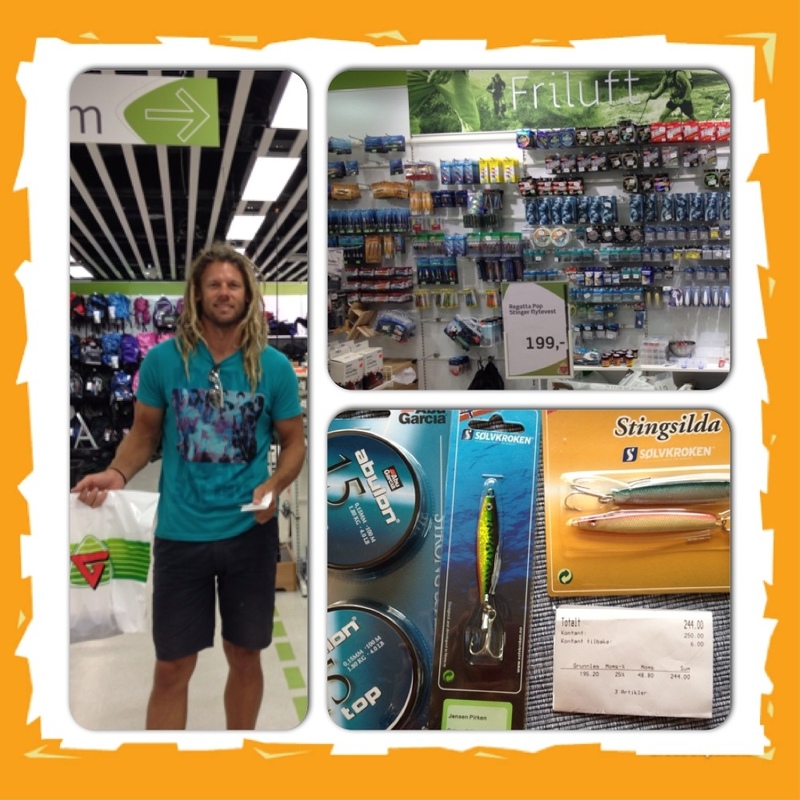 Back at the Intersport store in Sandnes, we buy not just fishing line (this time the second strongest they have!) 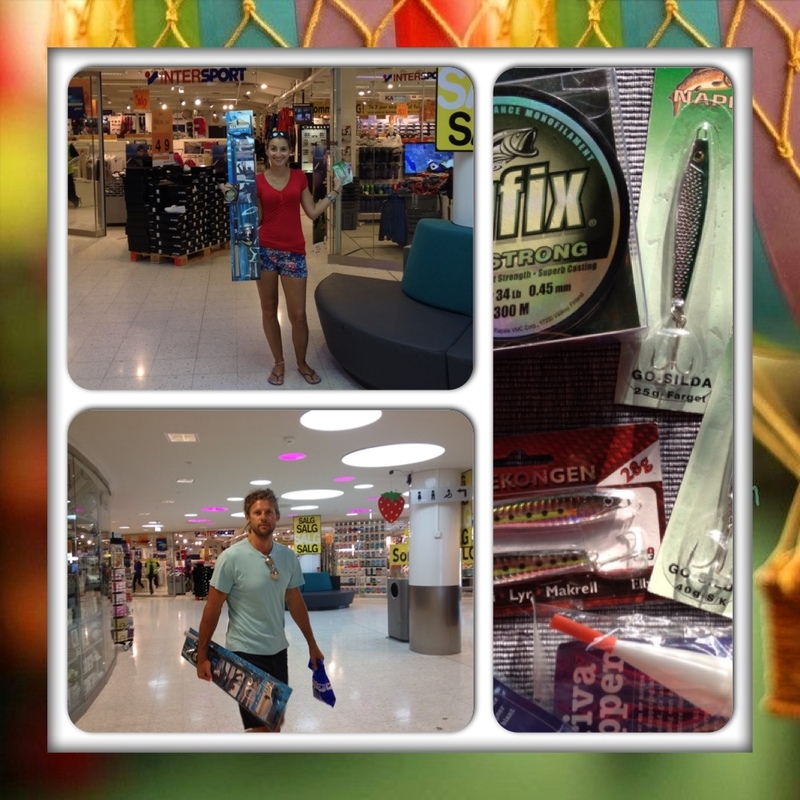 and more bait, we also buy (what we think are) floaties and even a new fishing rod. Over a hundred euros poorer we quickly get back to the same place… We better make up for this now by fishing every day and actually catching some too! Back at Dale with two rods, a stronger line and more bait, we keep fishing for an hour but pull nothing out but seagrass. Also the floaties dont seem to stay afloat and sink with the bait. I wonder whether we’ll ever have any luck fishing??? We change location one last time to a spot only just south of Dale and try fishing from a jetty this time. No fish.. An hour later, still no fish! My fishing rod keeps getting tangled and knotted up. During my last attempt I can’t seem to reel it in anymore as there are knots everywhere. I patiently de-knot what I can, while the hook with the bait is dangling at the bottom of the sea. Finally I seem to be able to pull it out, obviously with a lot of seaweed on it as it is quite heavy. Eeeew so we’re having crab for dinner, are we?? Logan puts up a little fight with the crab, he’s a strong little creature! Then we take him up and throw him in boiling water. Poor thing, threw off one of his claws in stress. Logan seemingly enjoys his crab dinner, while I only have a few small bites of his fish he caught earlier. Funny enough he hooked himself later that evening crying out for help, hahaha! As we still need to wait a few hours for the ferry to take us from Hirtshals in Danmark to Kristiansand in Norway, we both decide to go for a run – individually though, as I could never keep up with Logan’s speed and distance. While Logan is running towards the town of Hirtshals, I’m running along the beach in the other direction. The weather is cool, windy and sometimes rainy; probably quite good for a run! Soon I’m forced to turn around as there is a small river (or creek) separating the beach. It is too wide to jump, so I’m turning around, running back towards the van. Just as I arrive, Logan also returns from his run and decides to go for a refreshing swim in the Baltic Sea. A few people stare, it is probably rather uncommon for a person to go swimming in this kind of weather. It is then soon time to drive over to the ferry terminal. We are one of the first to arrive and one of the last to go on the ferry – of course. Once on the Fjordline Express ferry we get comfortable in the “comfort seats” in the top level and soon daze into a shallow sleep as it’s already past 11:30pm. The ferry ride only takes 2 hours and 15 minutes. There were two children on board who would also cry for those two hours and 15 minutes – non-stop!! How very exhausting for everyone on board, also for the toddler himself to cry for over two hours without a break, wow! I’m glad once we get back to the van and am looking forward to falling asleep very soon… But of course the appearance of our flower-decorated van, the peace sign hanging from the mirror and Logan’s deadlocks lead to the customs officers stopping us to get our van sniffed through by a dog! 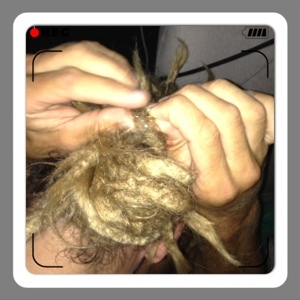 I was already highly amused about how the cliché of someone with dreadlocks got us into this situation but the creme dela creme was the the question of the officer: You smoke? Marijuana? Cannabis? Logan laughed and responded: Don’t let the hair fool you, I’m not even smoking cigarettes! The disbelief in the officer’s face expression was priceless! 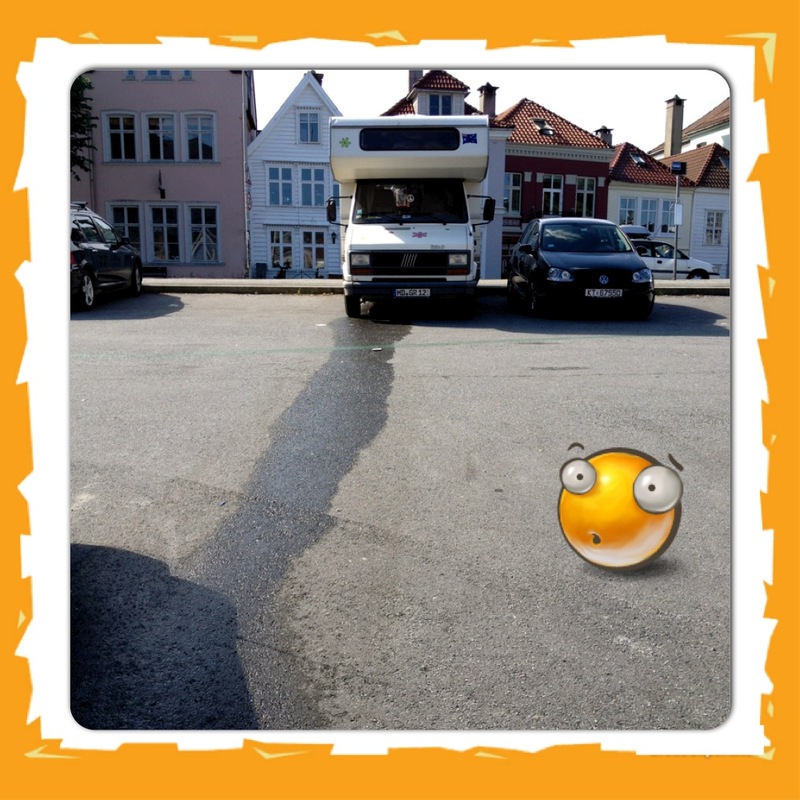 Finally we are able to pull up in one of Kristiansand’s side streets and get some rest. In the morning we have our first experience with grocery shopping in Norway. All we need is some water but a 5liter bottle of water is over 7€!!! All we end up buying are 4 bottles of bubbly water and instead of still water in a bottle we use the next opportunity at a shell station to top up water and also refill all our water bottles from a tap/hose supplied. And there is our next problem: When we want to refill diesel, the petrol cap won’t open! No matter how hard we try, it won’t open but instead just makes a clicking noise. 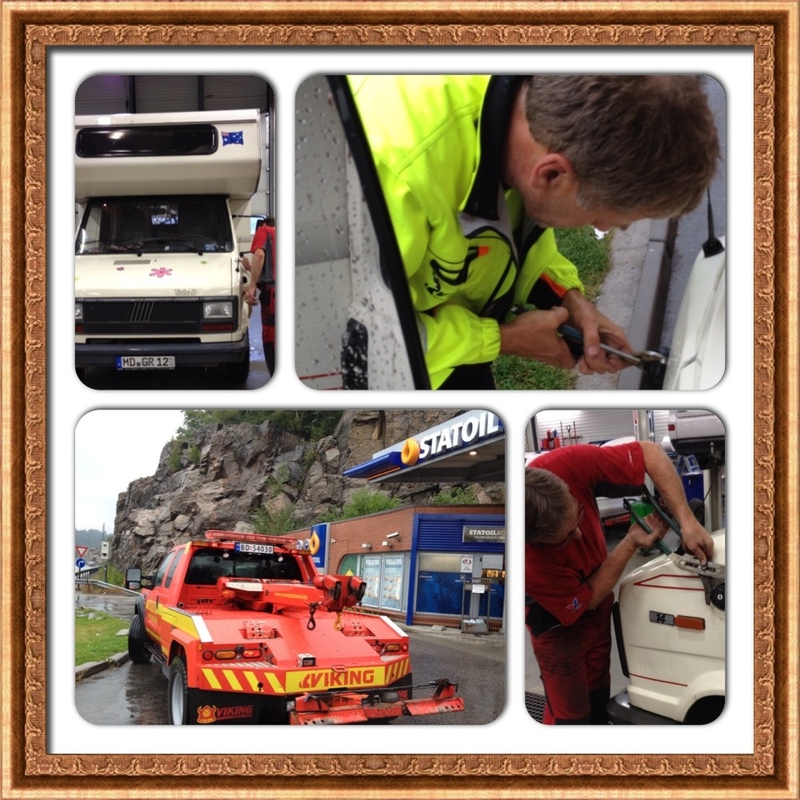 We have to call the German road ride assistance (ADAC) who then send us the Norwegian road side assistance “Viking”. It really pays to be a member! After the nice assistant doesn’t seem to have any luck with our petrol cap either, we are being taken to a mechanic who then breaks the lock in the cap. This service didn’t cost us a cent. The only little problem now is that we can’t lock the cap anymore and it isn’t as tight as it should be, so hopefully there won’t be any dirt or sand falling inside the tank until I can replace the cap. Finally, by 2pm we are on the road westwards. 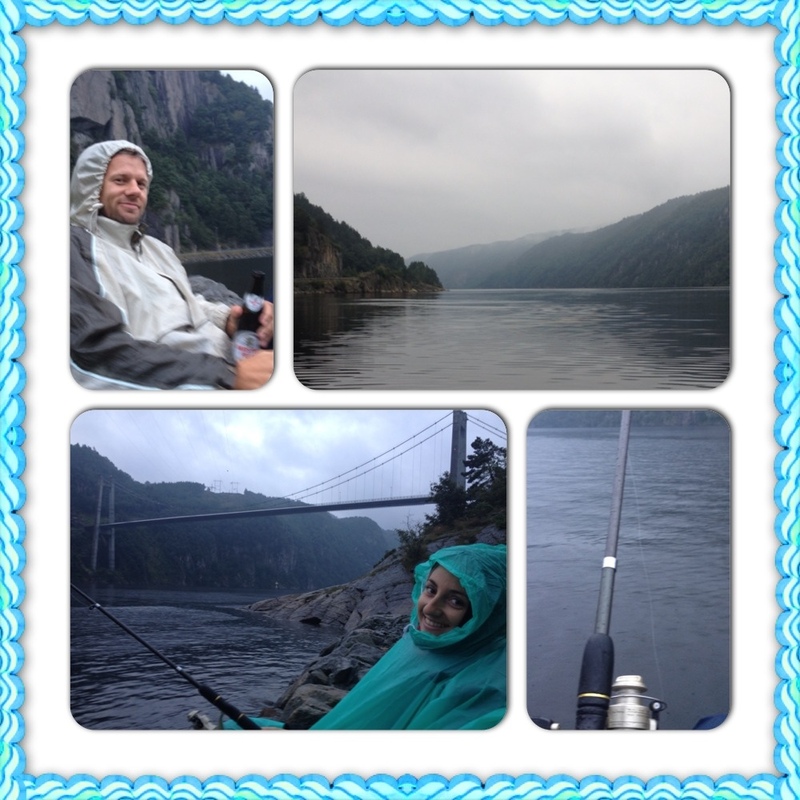 It has been raining all day today but our first impression of Norway is still a very good one. 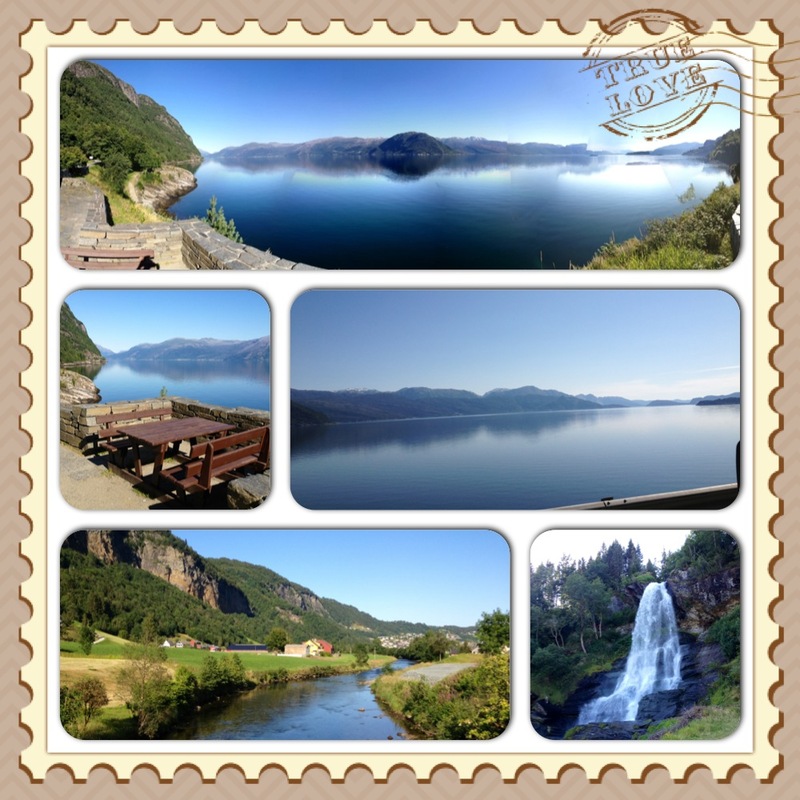 There are a lot of lakes and fjords everywhere along the south! First we stop at the south cape and take a few snapshots of the lighthouse, before moving on. 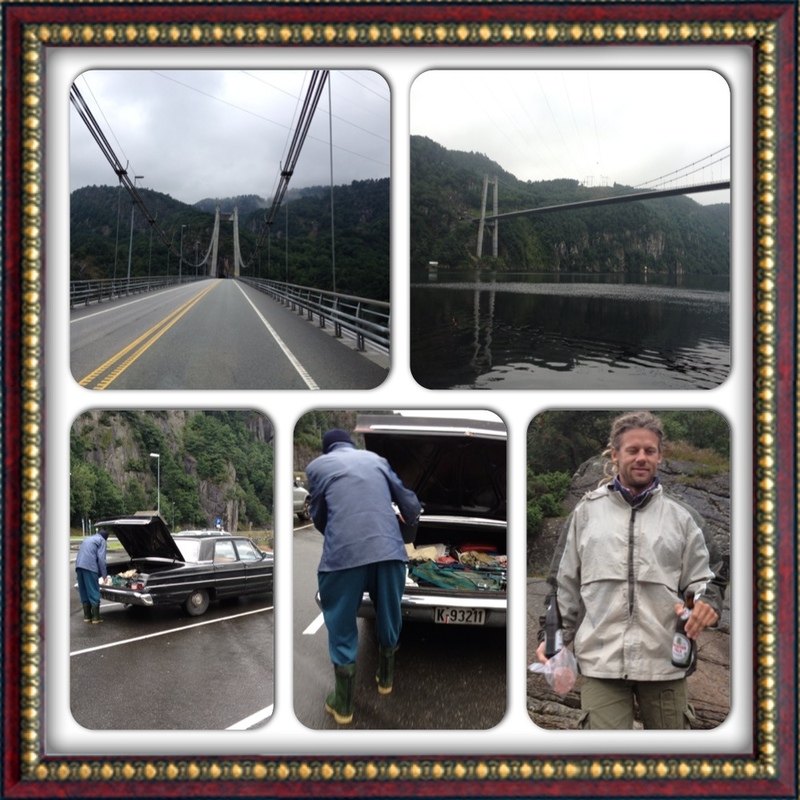 We make it to a place before Flekkefjord where we try our luck fishing again. We haven’t caught a single fish during all of our Europe trip, I wonder whether that is going to change today! While we are sitting patienly for 3 hours, trying all sorts of bait like fake fish, bread and sausage, “our fish” like to nibble but never bite; while the guy next to us is pulling one fish out after the other. Within 30min he’s got 4 fish and leaves. We keep on trying for a long time but eventually give up as the rain and especially mosquitos become unbearable. Soup for dinner tonight and we’re still smiling of course. But maybe we should consult a fishing expert before our next fishing adventure! Rain! Again! We’re making our way from Kiel to Flensburg along the Baltic Sea. Mum said: “You won’t need your fur jacket! It’s summer, even in Norway!” We’re still in Germany and I feel like wearing my warmest winter clothes! Arriving in Flensburg, the wind whistles through the ship masts. It’s Sunday, all the shops are closed and the city is quiet, so what is there for us to do? We find a free camp spot at the eastern side of the port and I suggest we should go fishing here. I’m getting changed into warm clothes and the moment I step outside the door: Rain! At first I’m being stubborn and want to go fishing anyway but soon have to admit that it’s not very pleasant out here. We retreat back to the van and watch some episodes of “Once Upon a Time” on the laptop. Occasionally there is a big ship going past, sounding the horn. In the morning Logan and I both wake up to “AUSTRALIA!” I can hear Logan turn around, to look out the window; now I’m curious too! A white van with red and blue painted windows and two kangaroos with the Australian flag are decorating the side. Logan caught a glimpse of the man who responded to someone asking where he was from. I only saw him leaving. This is only the second time we saw someone from down under within the last 5 months. I wonder if he saw our Australian flag at the front of our van?! The shops are open today in Flensburg and we find our way to Karstadt, a popular German shopping centre that you’ll basically find in every city. Finding water tabs wasn’t easy so far, so I cheekily fill two bottles up with water in their bathroom which then discretely disappear in my bag. We also buy some more wet baby wipes, which turned out to be very practical in a camper’s life! Still raining we only browse through a few more shops (I noticed many signs here are already in Danish!) and then leave for Danmark. The border is only a few kilometers from Flensburg. We aim for Aarhus today, as it is about half way to Hirtshals, the town we need to catch the ferry from in two days. Aarhus seems to have a nice core with old buildings. Logan points out that more people here are blonde and paying attention to it, it’s true! Well over 50 or 60% are blonde! 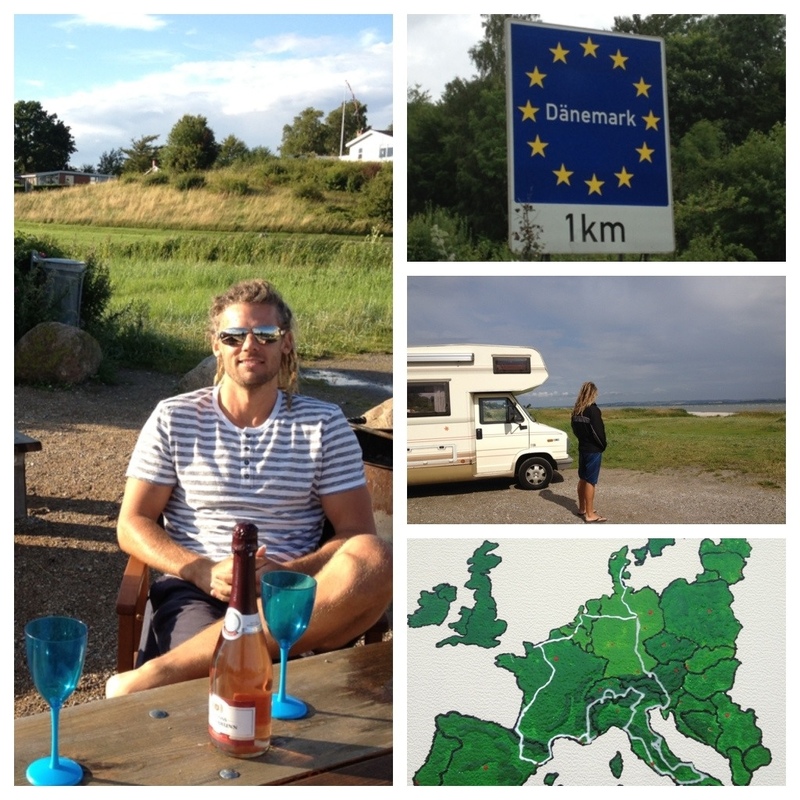 Just behind Aarhus we find a lovely place right at the beach that will be our home for tonight. The weather has cleared up a little, though still cloudy and very windy! A few people get ready for kite surfing on the Baltic sea, while we are going for a walk along the tidal flats. Someone must have dug in the sand here before for mussels or oysters as there are holes and big mounts of sand next to them everywhere. While we enjoy the late afternoon and evening outside on our chairs with a glass of wine, we keep seeing people going for strolls along the beach and the high grass with their dogs. One family enjoys a snack next to us while their two Golden Retriever girls “Malou” and “Bela” come and receive a lot of cuddles from us. Such happy, enthusiastic and greedy (hoping for a snack from their owners) dogs! What’s for dinner? Kässpätzle!!! Oh yea, one yammie traditional German meal! Logan is still licking his fingers!